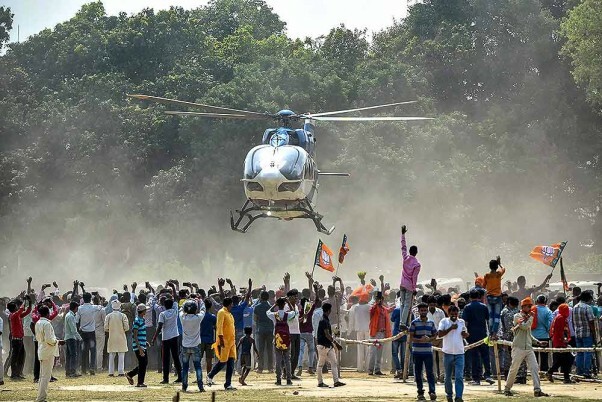 BJP supporters wave towards the helicopter of party President Amit Shah as he leaves after an election campaign rally ahead of the Lok Sabha polls, in Begusarai district. 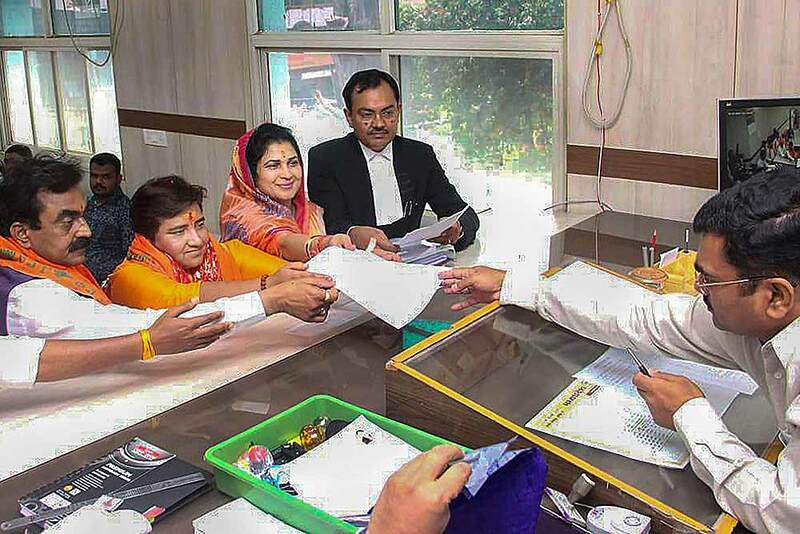 MP Udit Raj being welcomed by DPCC President Sheila Dikshit as Congress leader KC Venugopal and Randeep Surjewala look on, at the party headquarter in New Delhi. 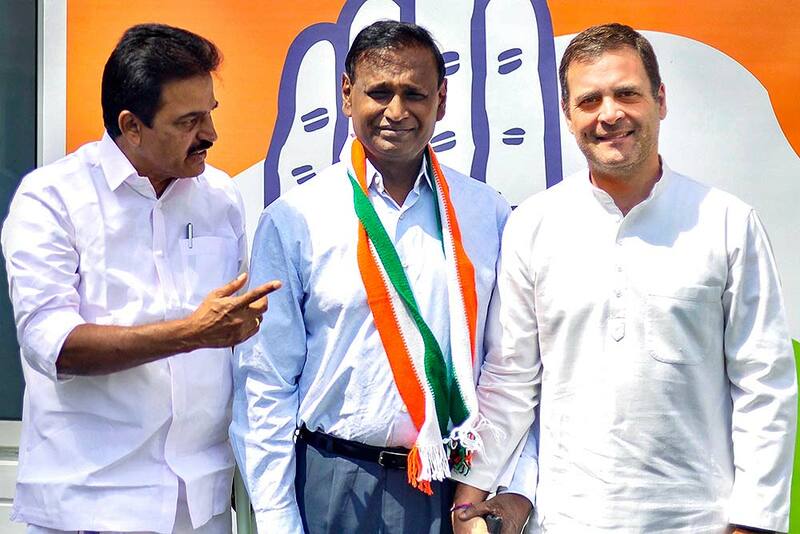 Udit Raj joined the Congress party leaving BJP, a day after he was denied the BJP ticket for North West Delhi parliamentary seat. 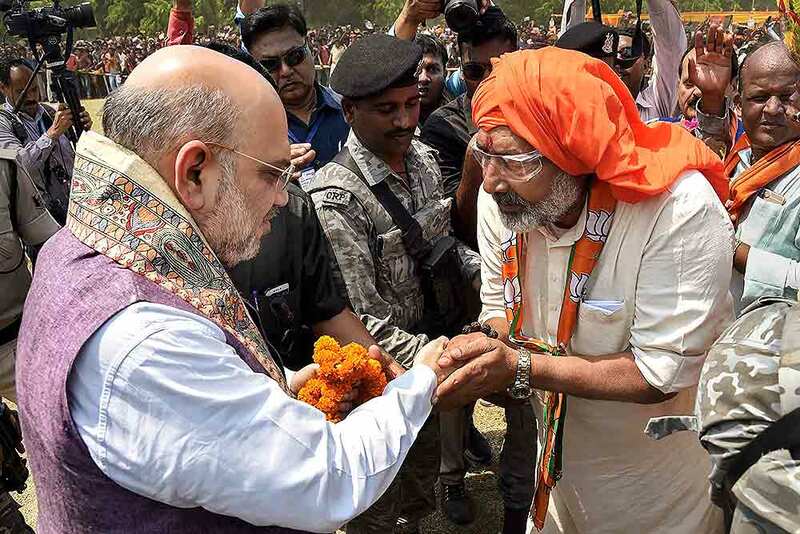 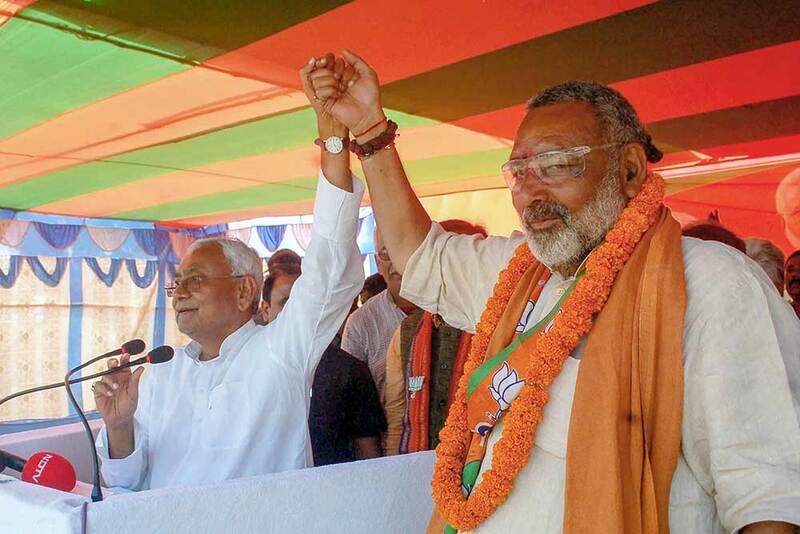 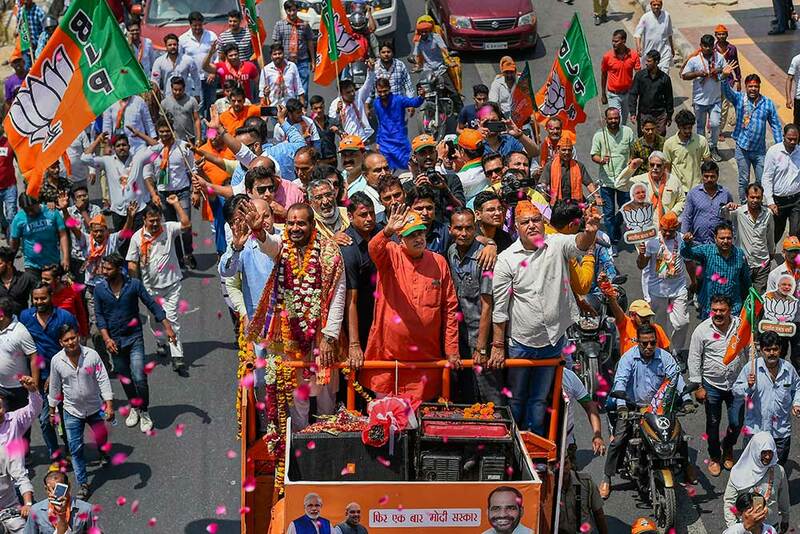 BJP President Amit Shah is greeted by party candidate Giriraj Singh during an election rally ahead of the Lok Sabha polls, in Begusarai district. 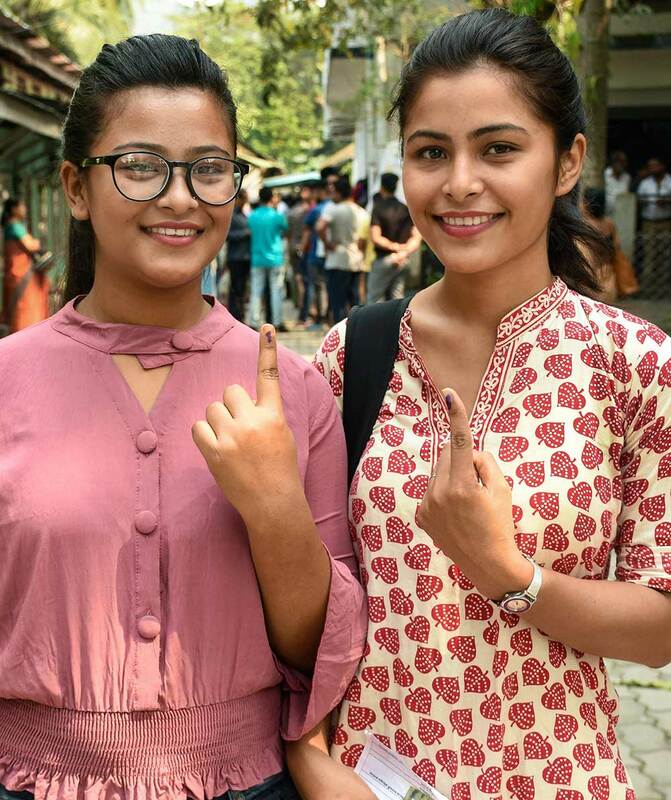 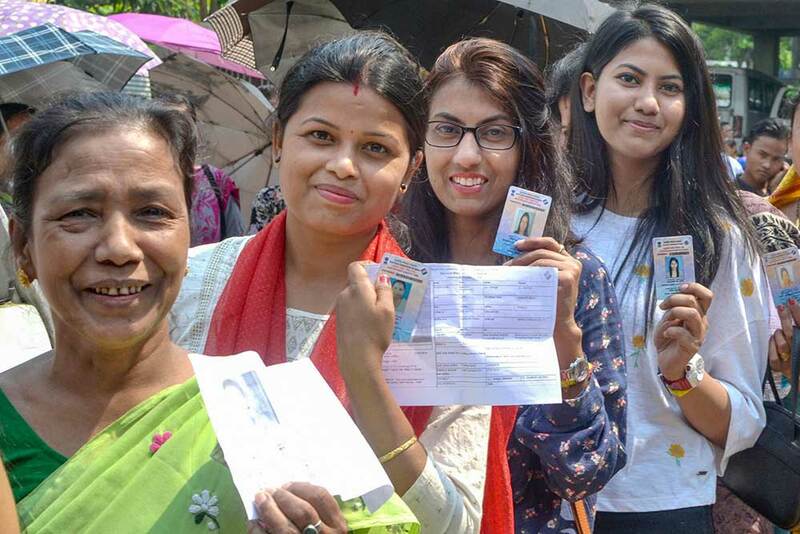 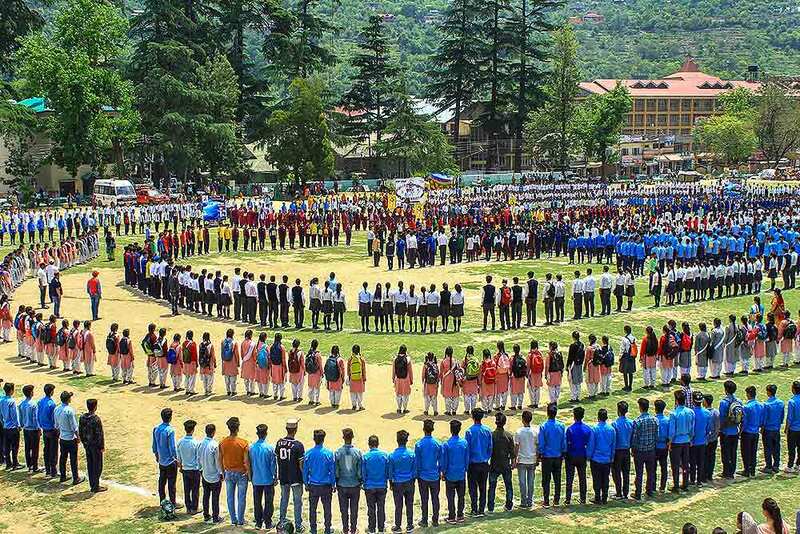 Students take part in a voting awareness campaign in the view of ongoing Lok Sabha elections, in Kullu, Himachal Pradesh. 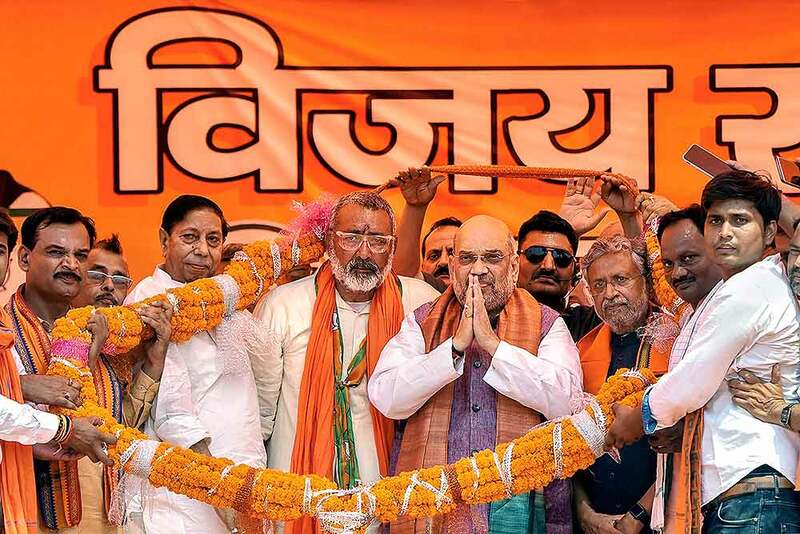 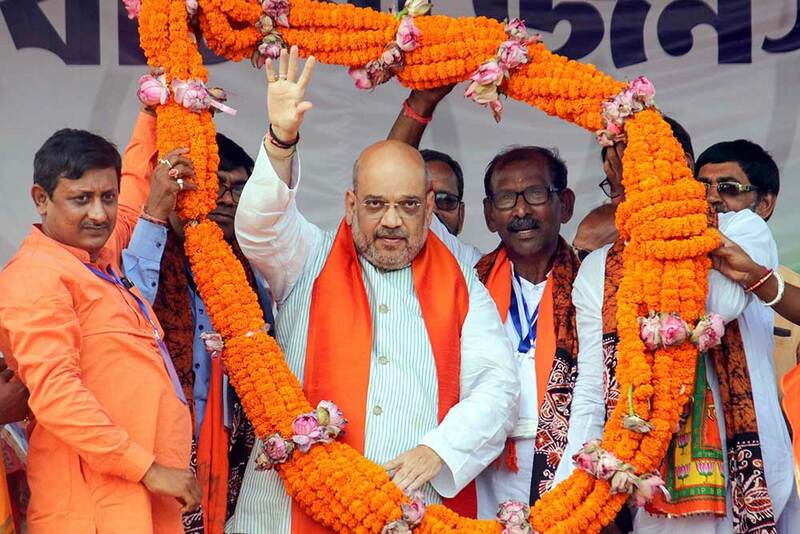 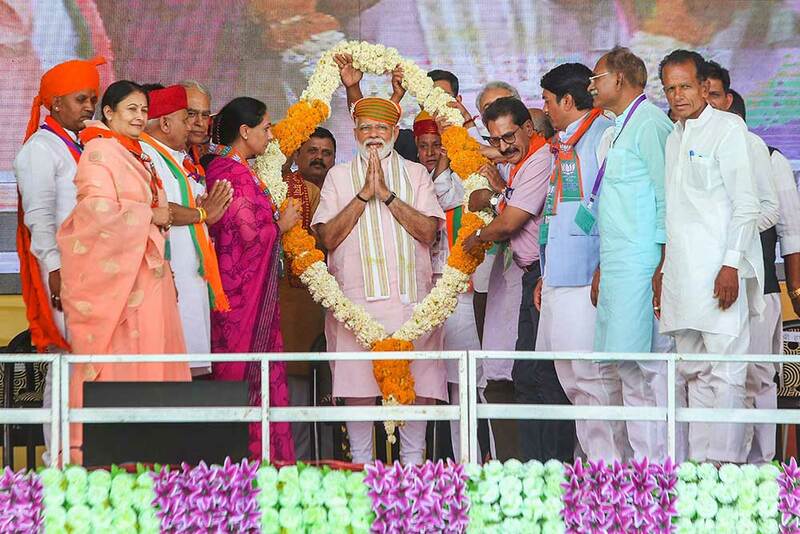 BJP President Amit Shah being garlanded by the party workers during an election campaign rally ahead of the Lok Sabha polls, in Begusarai district. 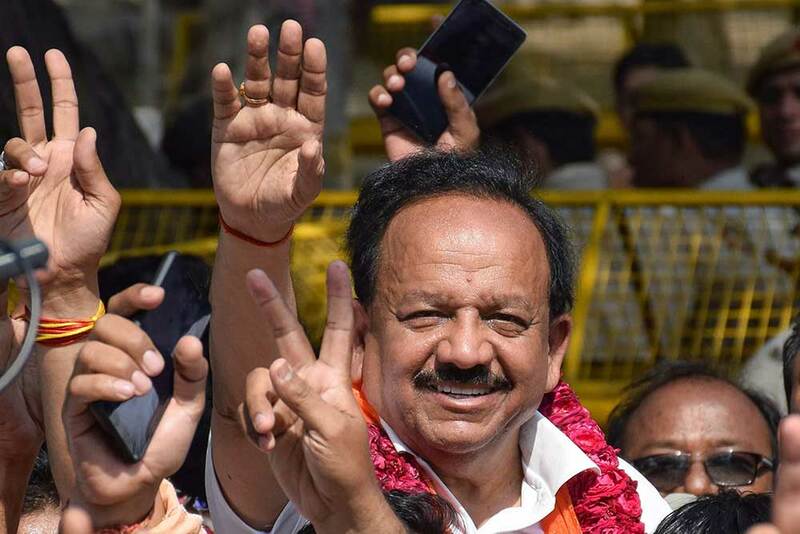 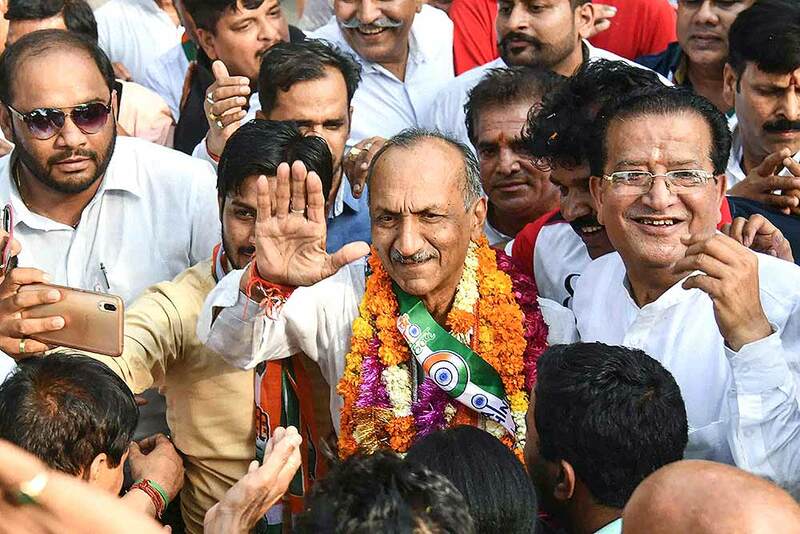 Senior Congress leader and party's candidate from Chandni Chowk JP Agarwal waves at supporters after filing his nomination papers for Lok Sabha elections, in New Delhi. 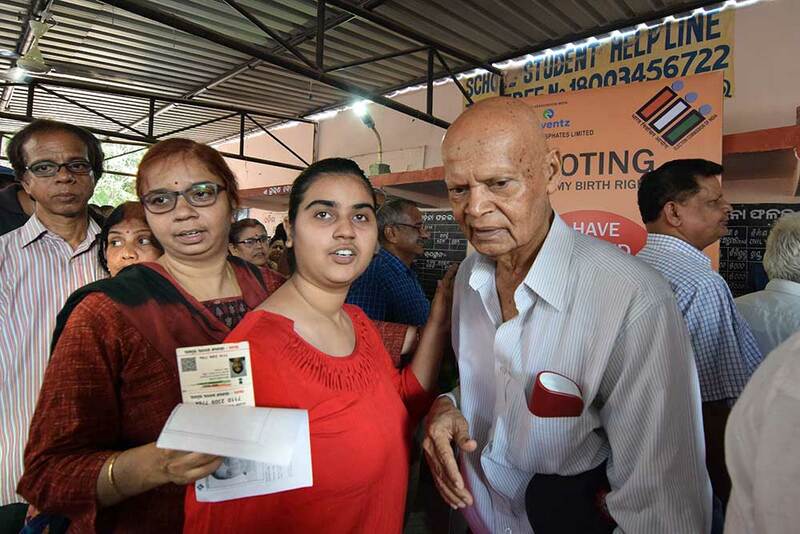 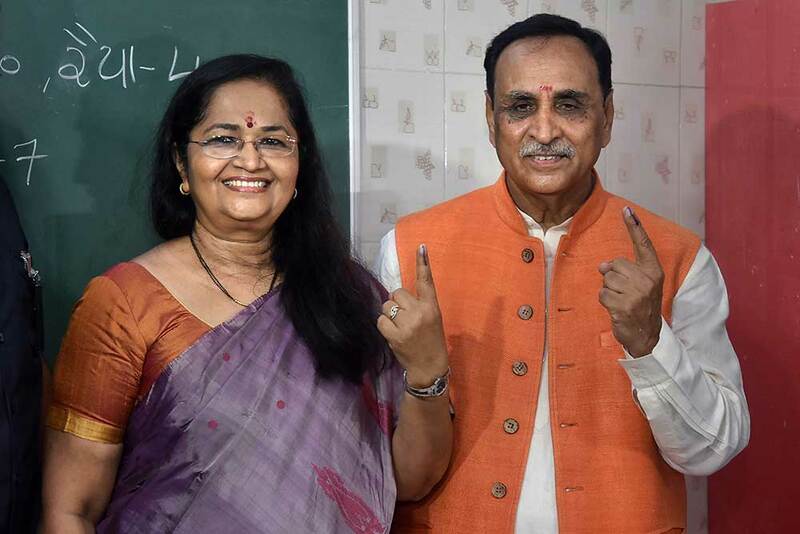 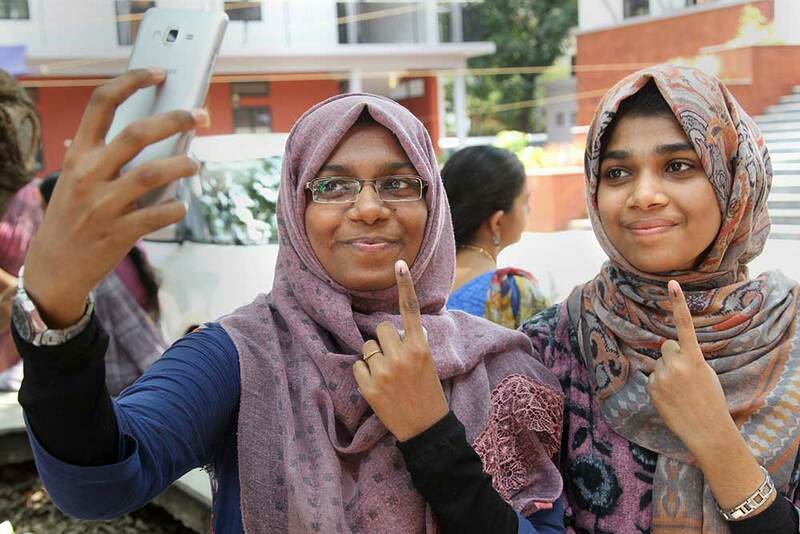 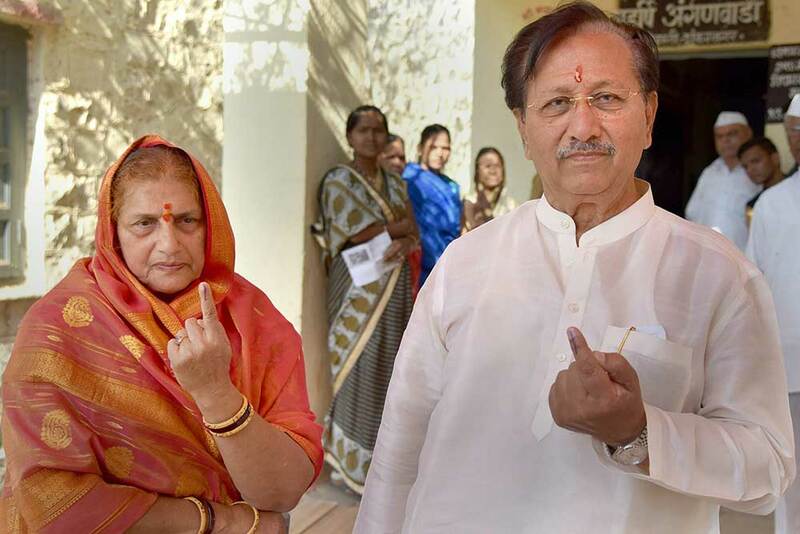 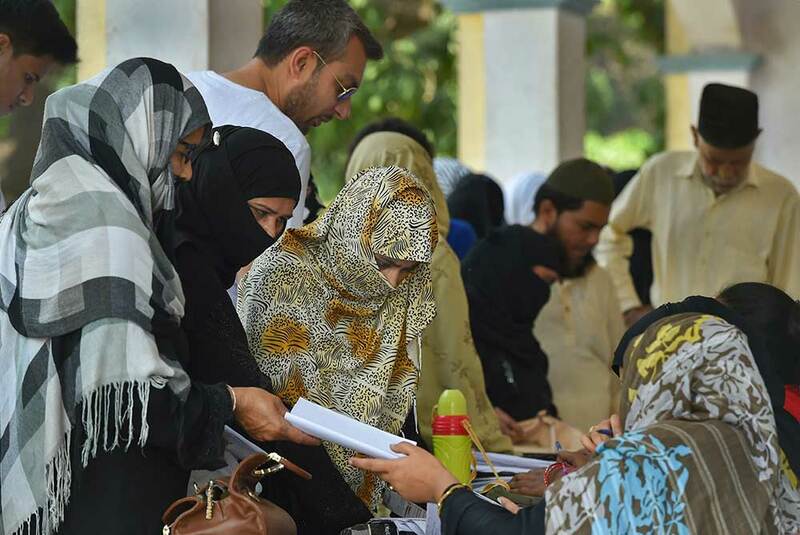 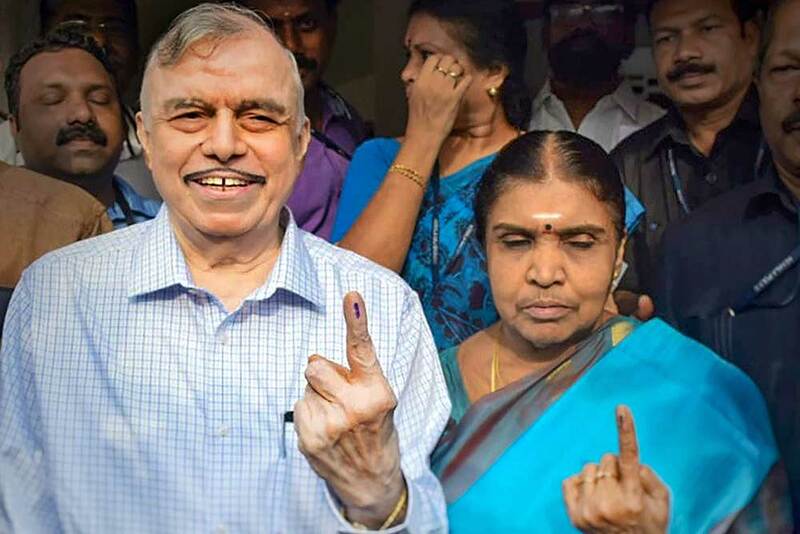 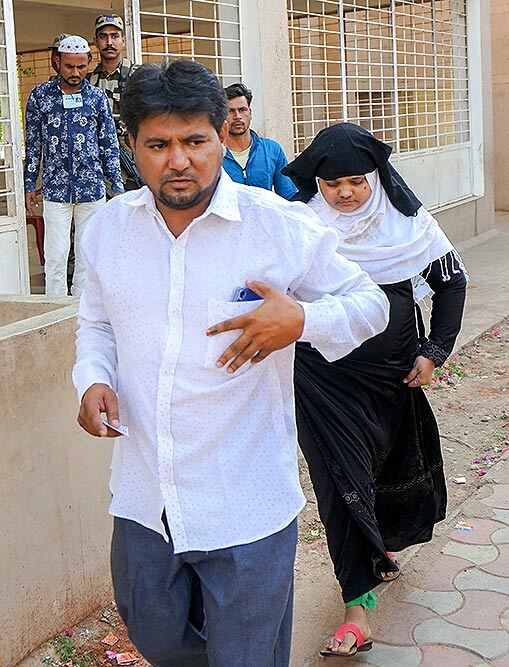 Bilkis Bano and her husband Yakub Rasool leaves the polling booth after casting their votes for the third phase of Lok Sabha elections, in Dahod. 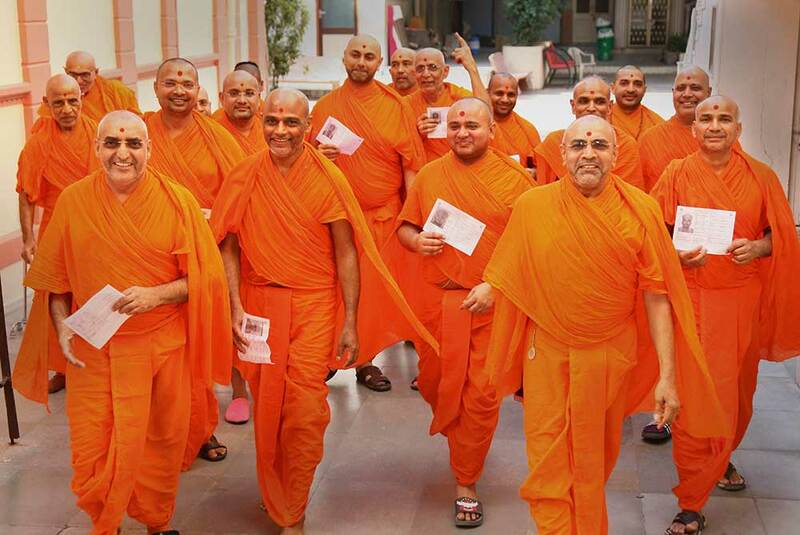 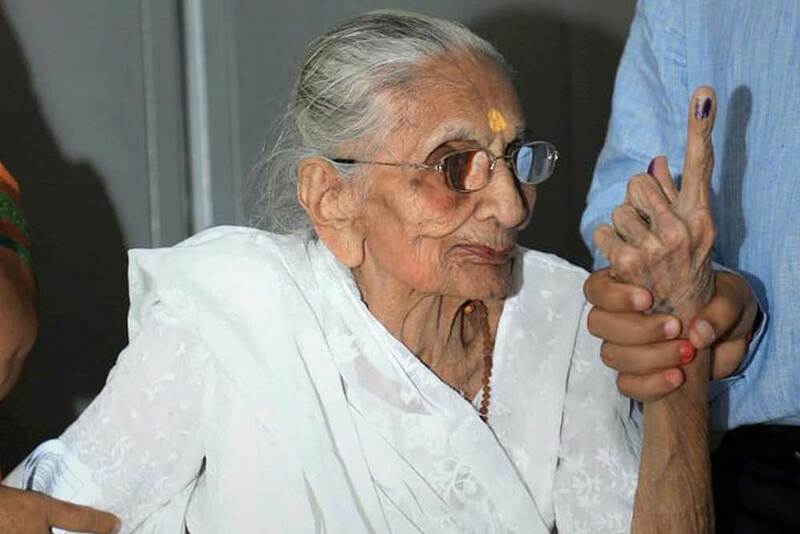 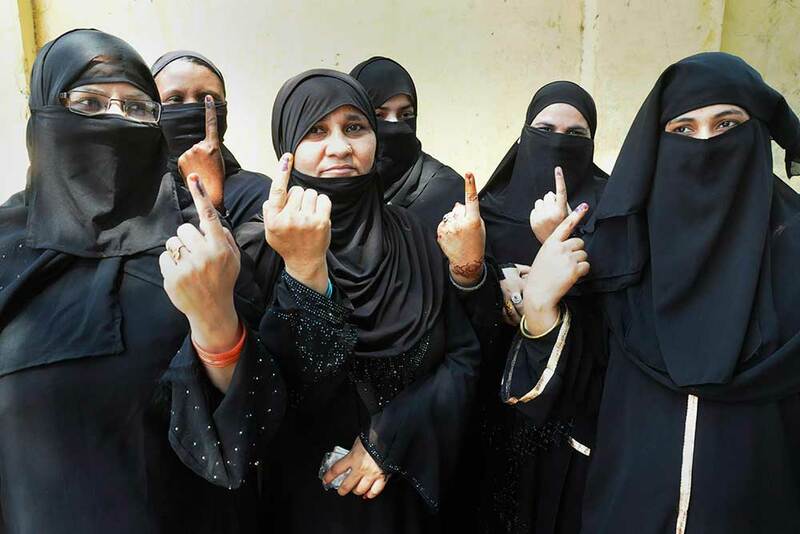 The Supreme Court has directed the Gujarat government to give Rs 50 lakh compensation, a job and accommodation to Bano who was gang raped during the 2002 riots in the state. 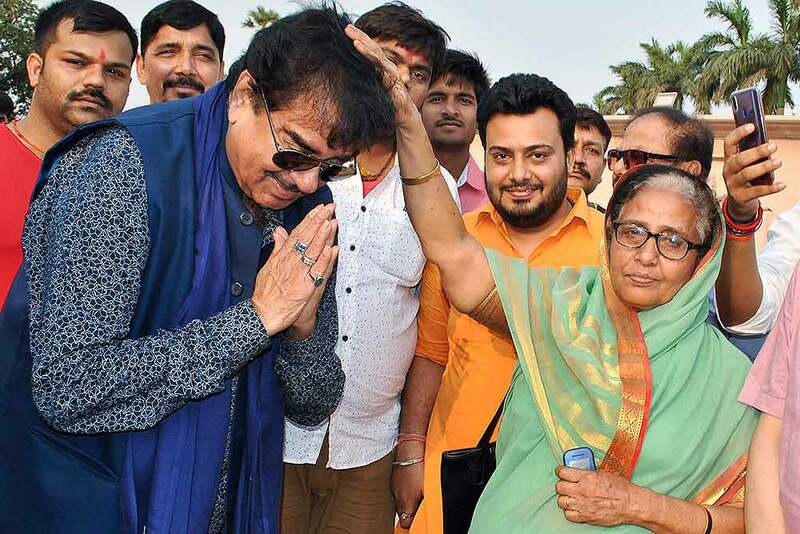 Congress candidate from Patna Sahib seat Shatrughan Sinha during his election campaign for the Lok Sabha polls 2019, in Patna. 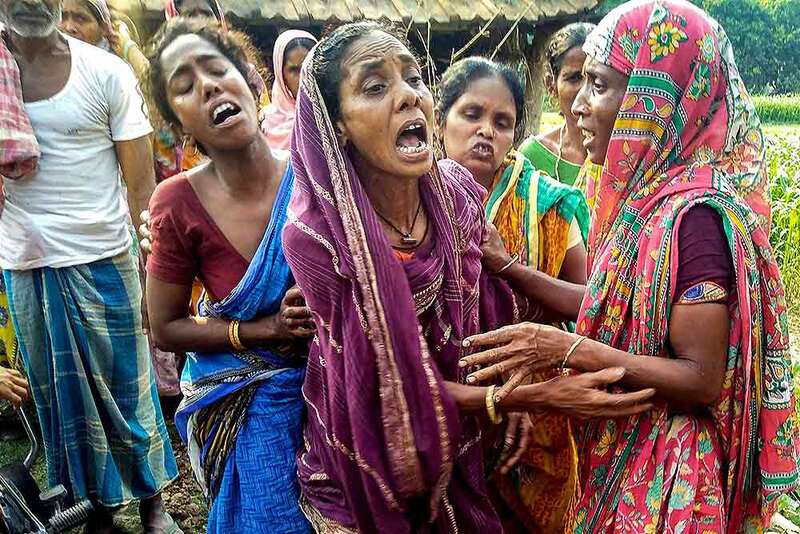 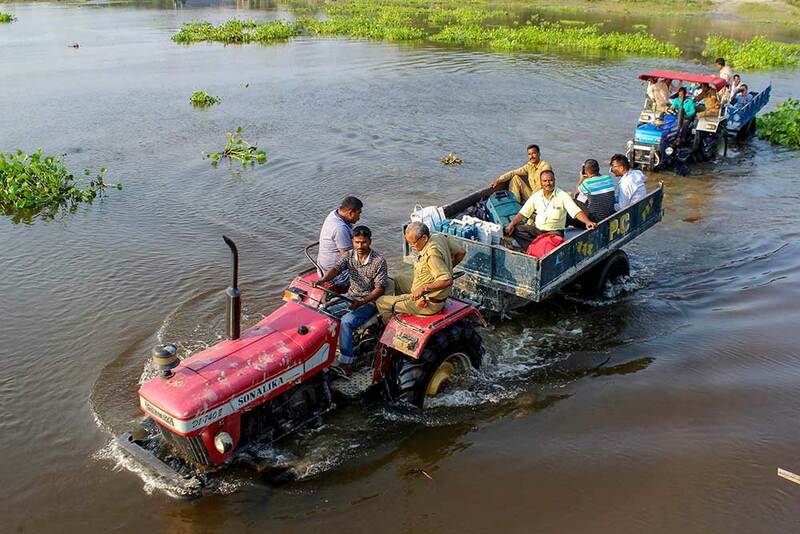 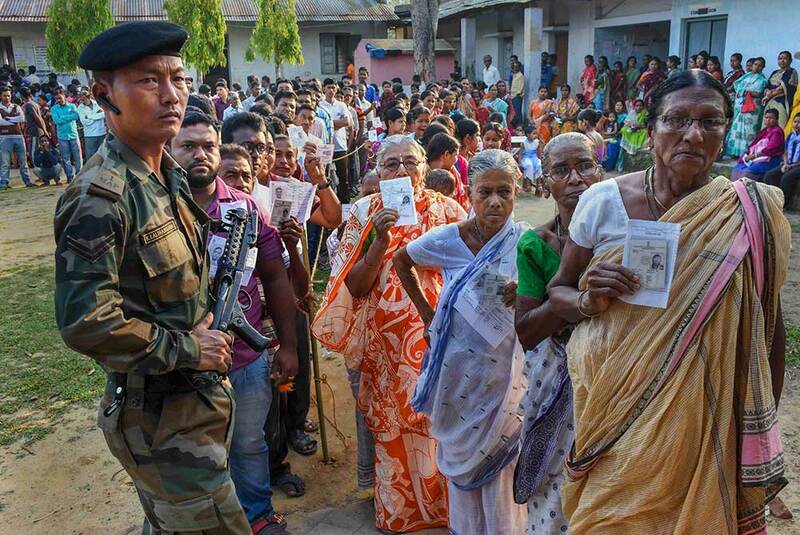 Grieving family members of a Congress worker who was killed in a political clash during the third phase of Lok Sabha elections, at Bhagabangola in Murshidabad district. 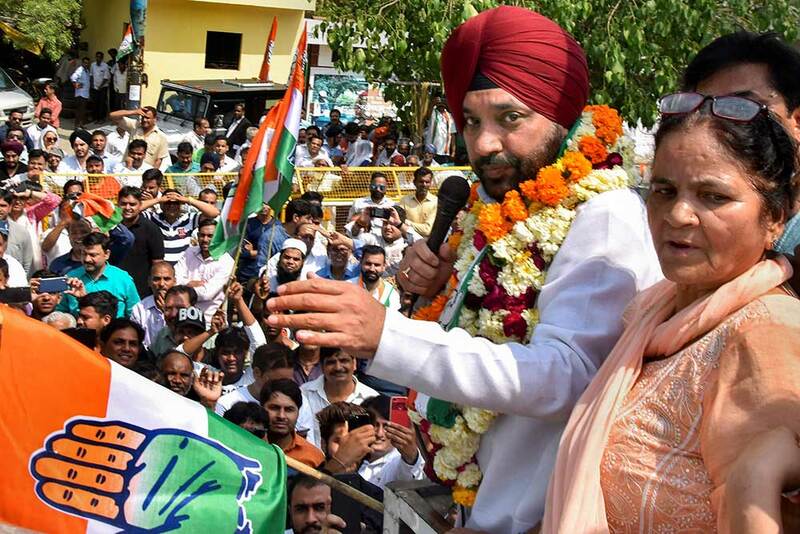 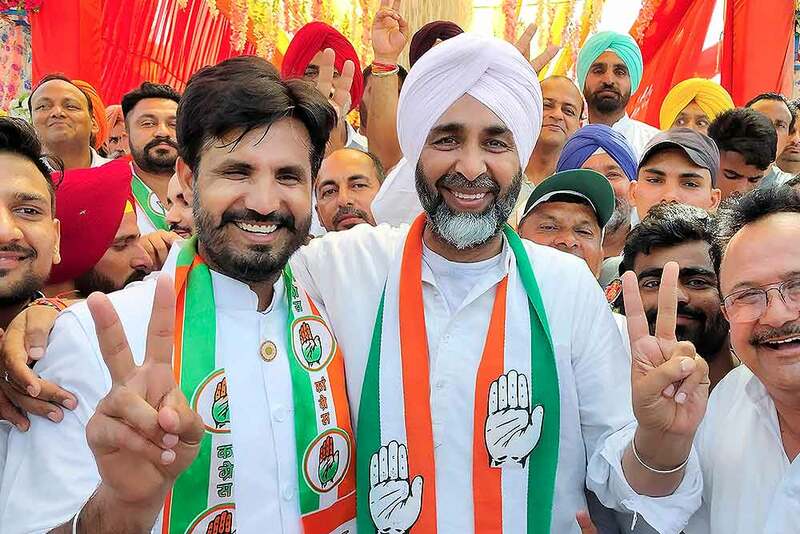 Congress candidate for Bathinda Lok Sabha seat Amrinder Singh Raja with Punjab Finance Minister Manpreet Singh Badal during an election campaign roadshow in Bathinda. 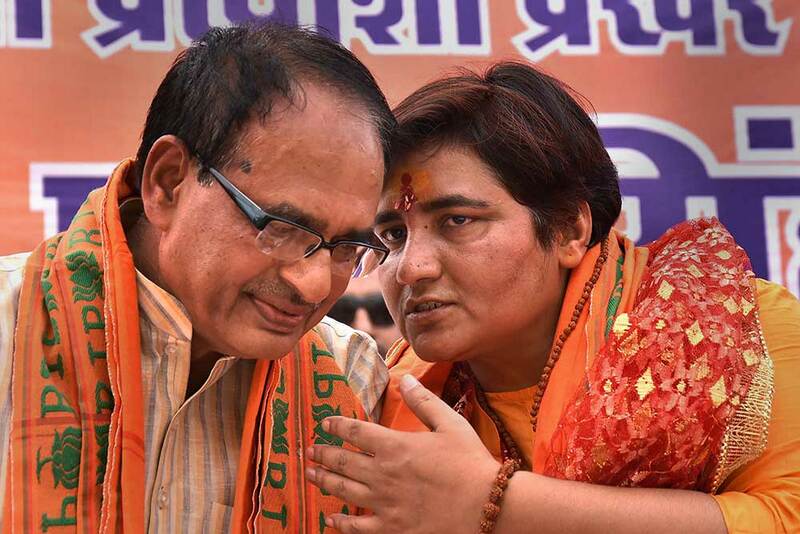 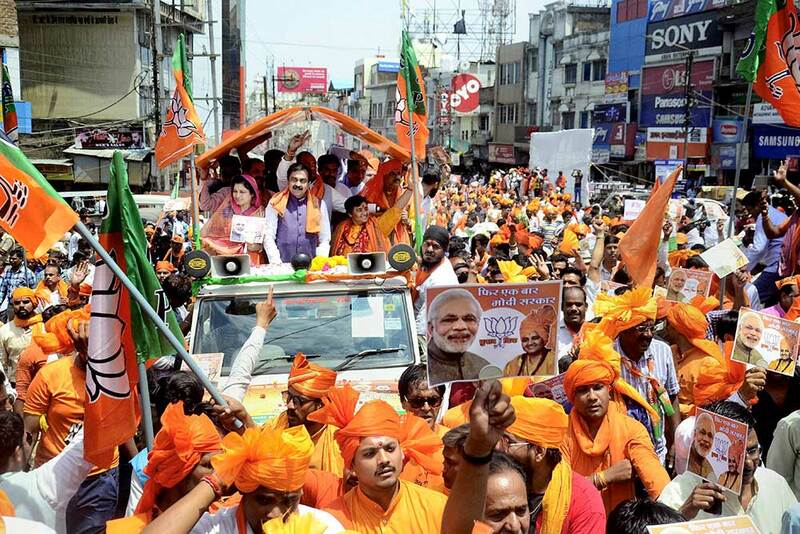 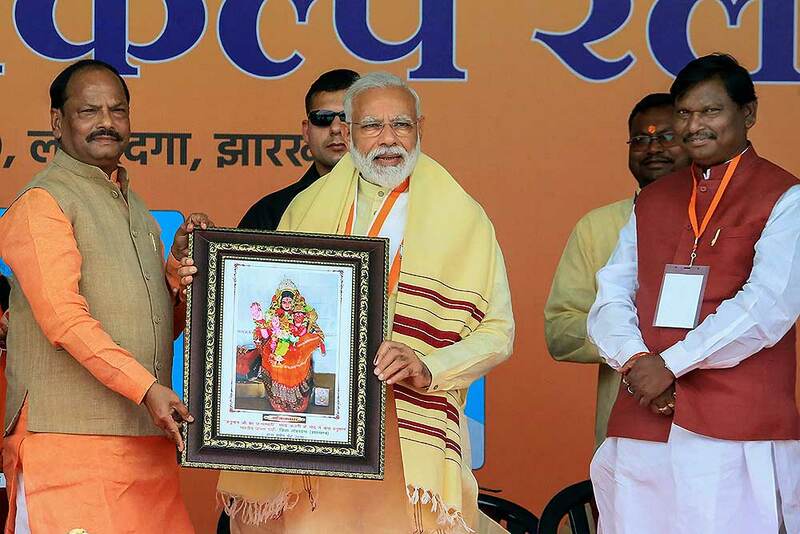 BJP candidate for Bhopal Lok Sabha constituency, Sadhvi Pragya Singh Thakur, during an election campaign, in Bhopal. 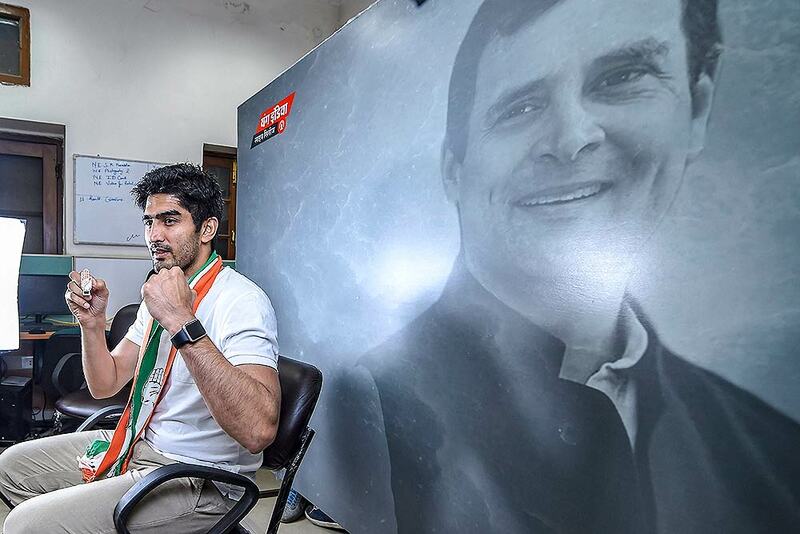 Boxer and Congress candidate from South Delhi constituency Vijender Singh poses for photograph at Youth Congress office, ahead of the Lok Sabha polls in New Delhi. 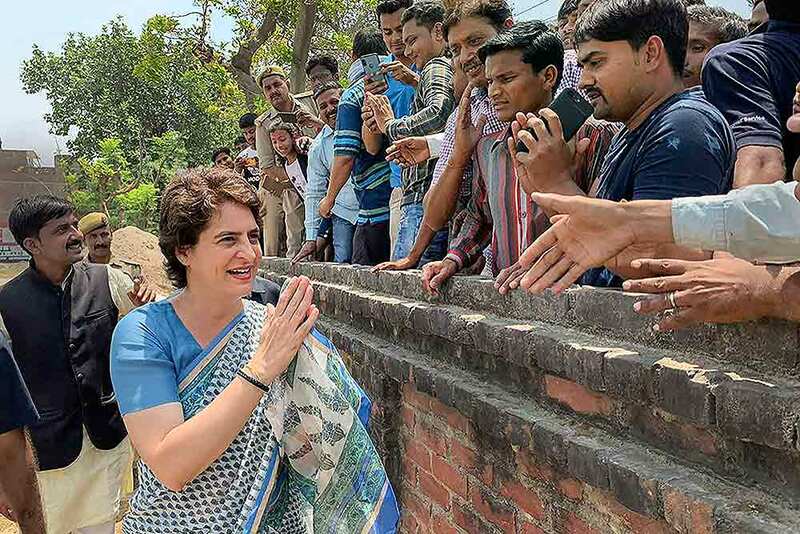 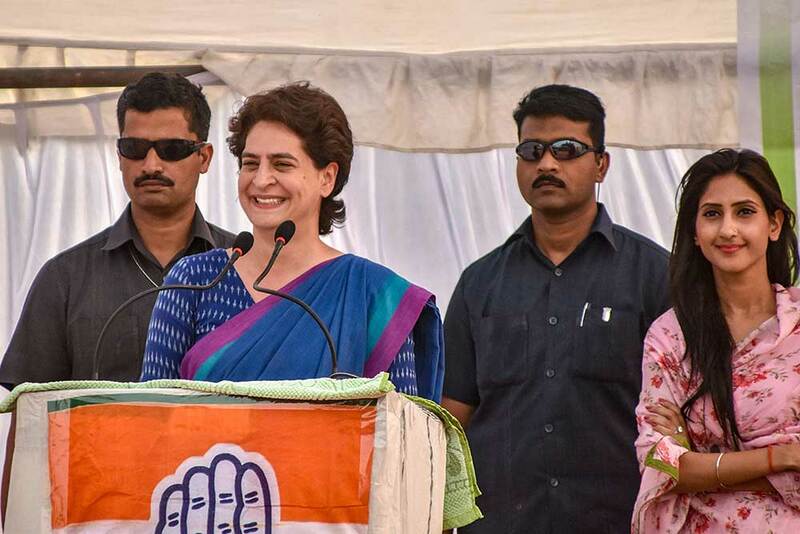 Congress General Secretary Priyanka Gandhi Vadra meets her supporters during an election campaign for Lok Sabha elections, Fatehpur district of UP. 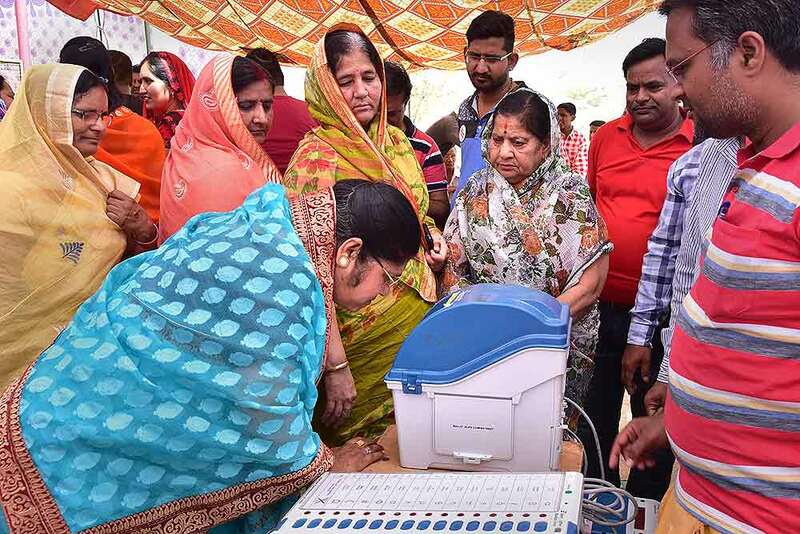 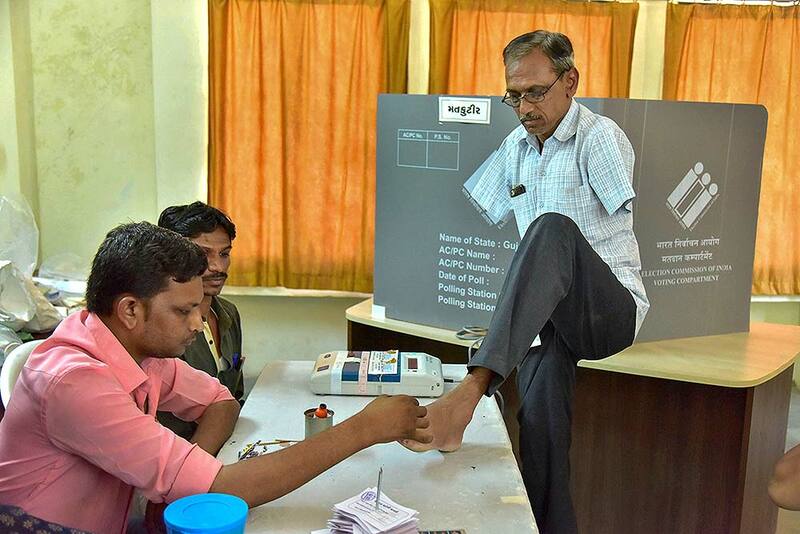 Electoral officials demonstrate the functioning of EVM (Electronic Voting Machine) and Voter Verified Paper Audit Trial(VVPAT) for the local voters during a voting awareness programme in Bikaner district. 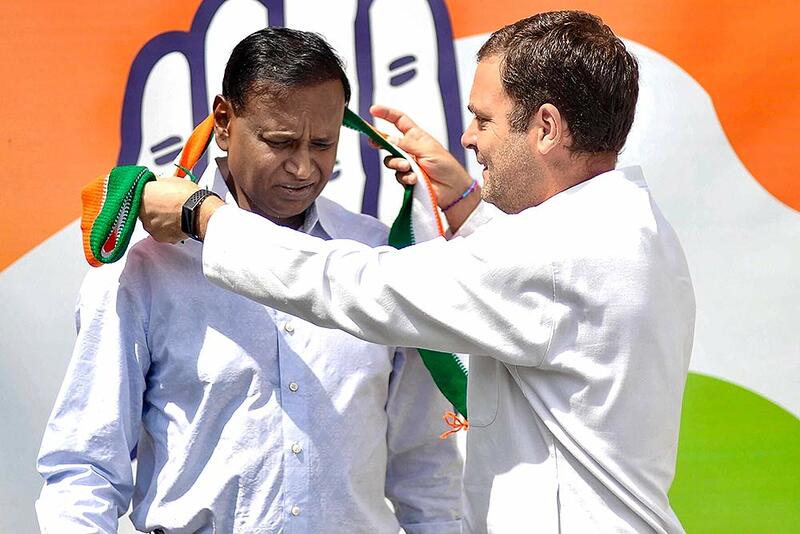 Congress President Rahul Gandhi felicitates BJP Lok Sabha member Udit Raj after he joined Congress, in New Delhi. 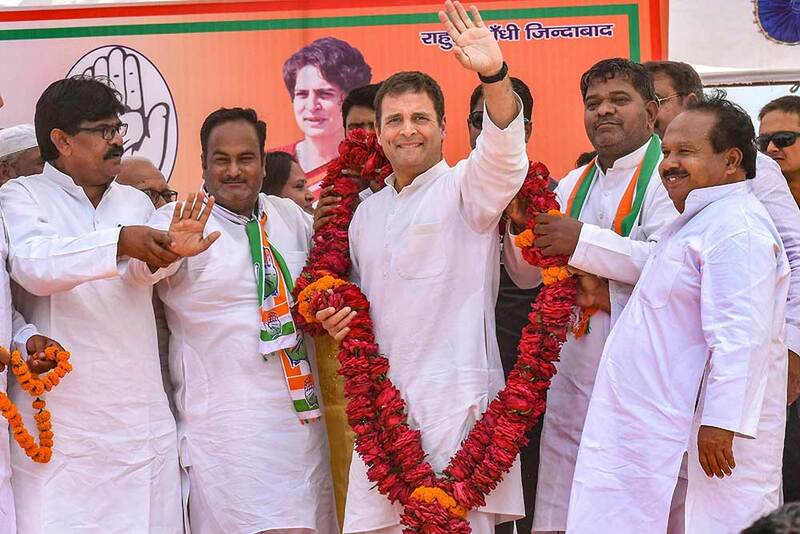 Congress President Rahul Gandhi meets BJP Lok Sabha member Udit Raj after he joined Congress, in New Delhi. 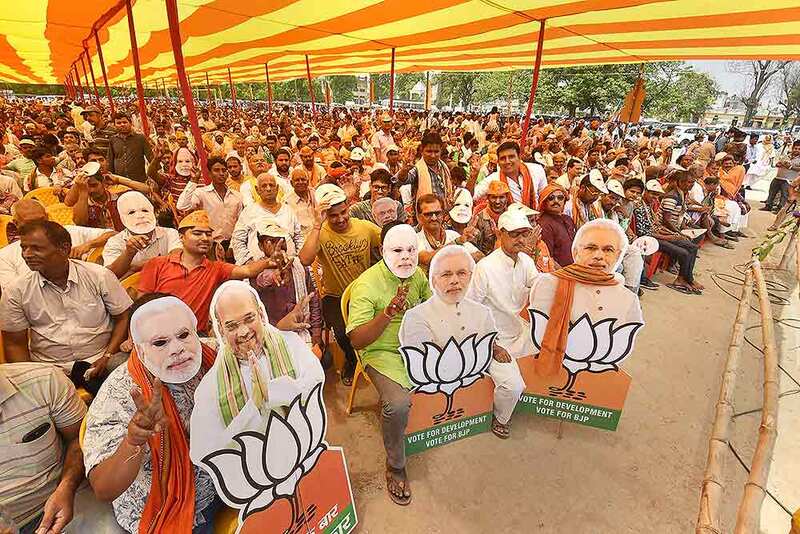 BJP supporters wear masks of Prime Minister Narendra Modi as they flash victory sign at an election campaign rally ahead of the Lok Sabha polls, in Begusarai district. 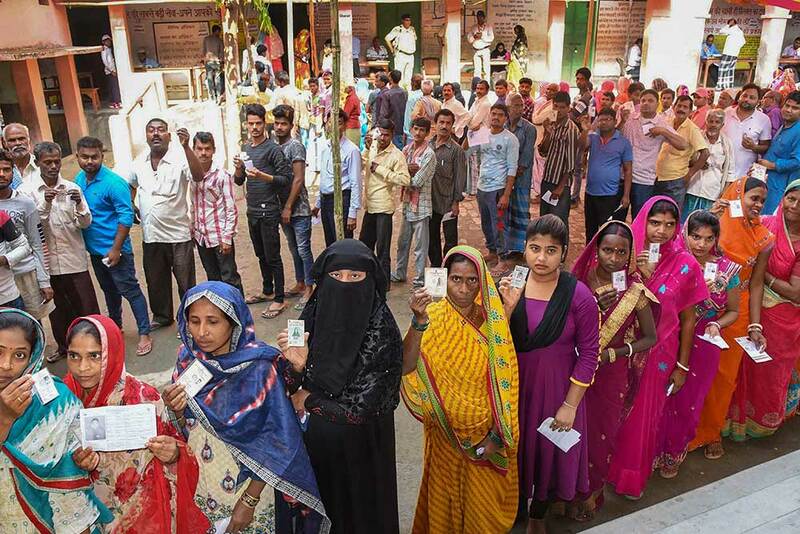 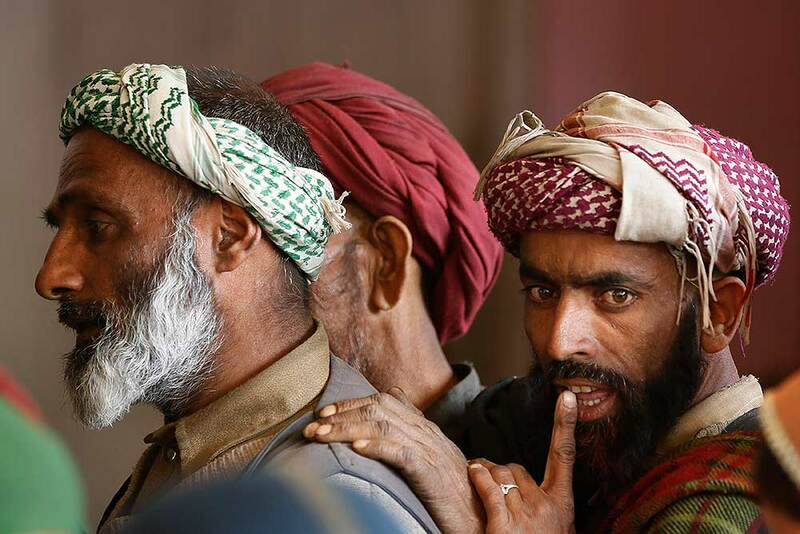 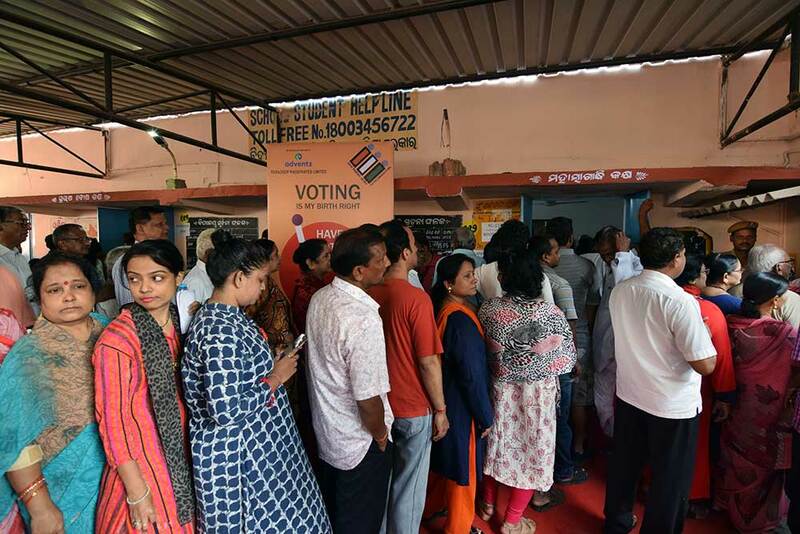 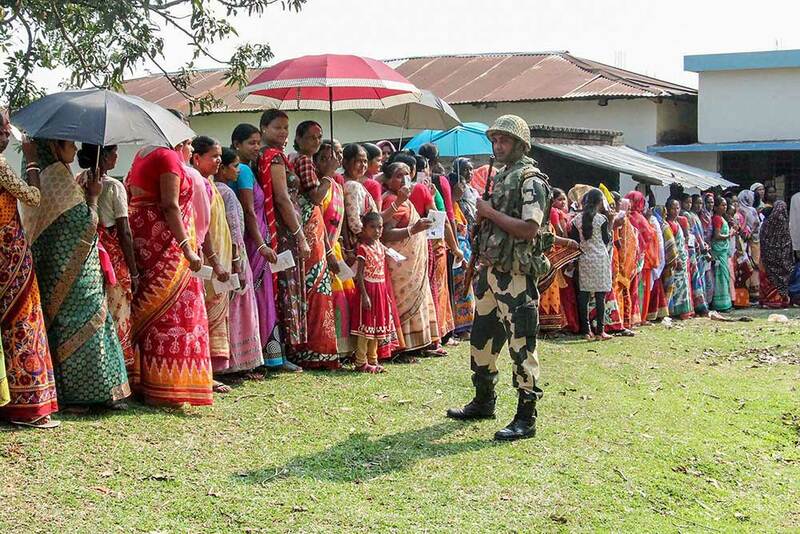 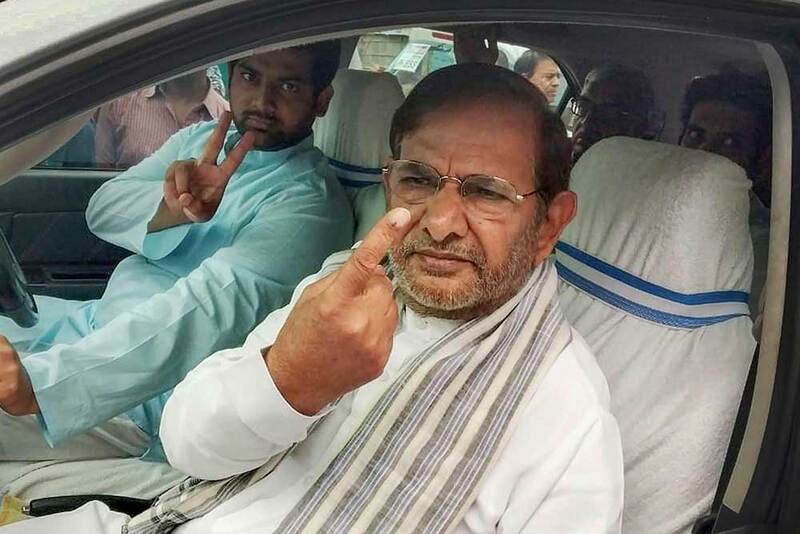 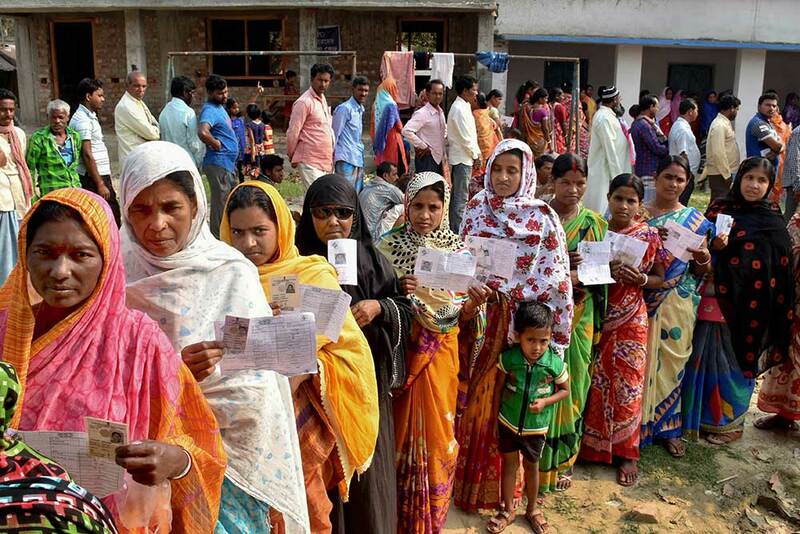 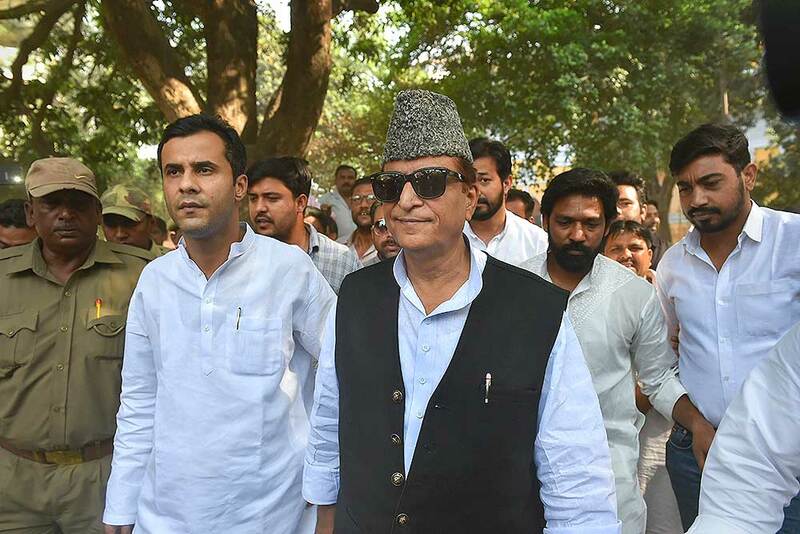 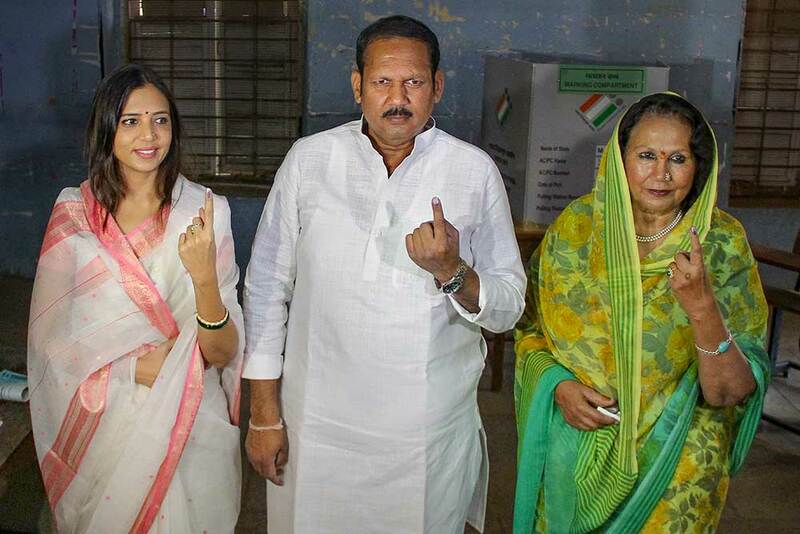 Samajwadi Party (SP) candidate from Rampur, Azam Khan, and his son Adeeb Azam Khan arrive to cast their vote, during the third phase of the 2019 Lok Sabha elections, at a polling station in Rampur. 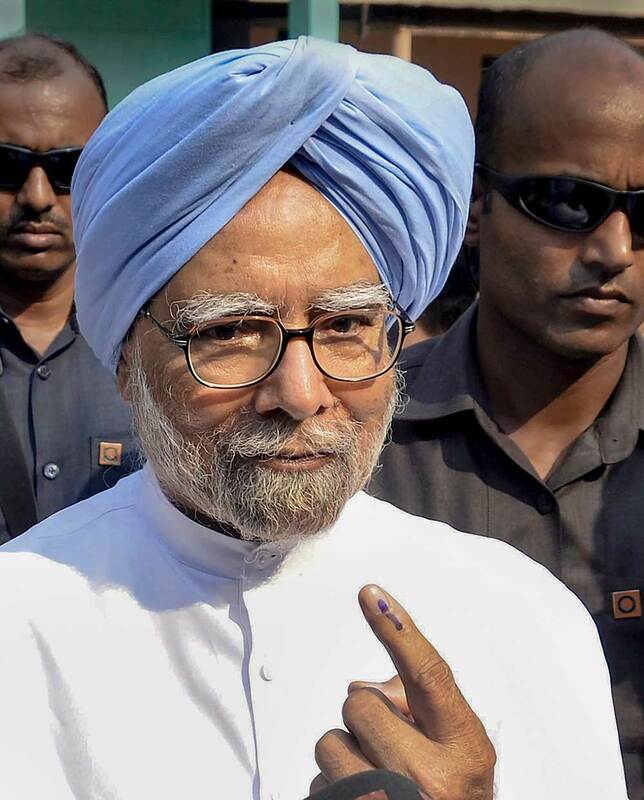 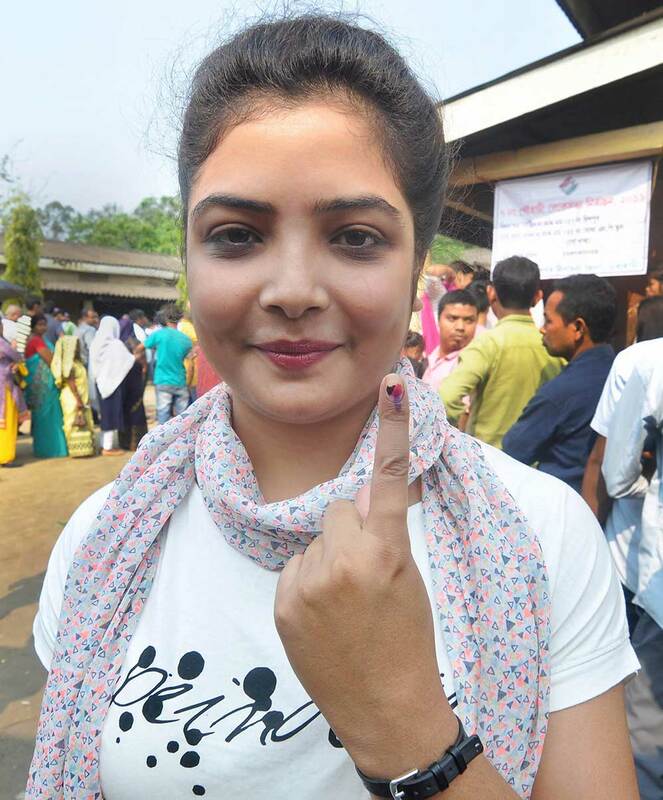 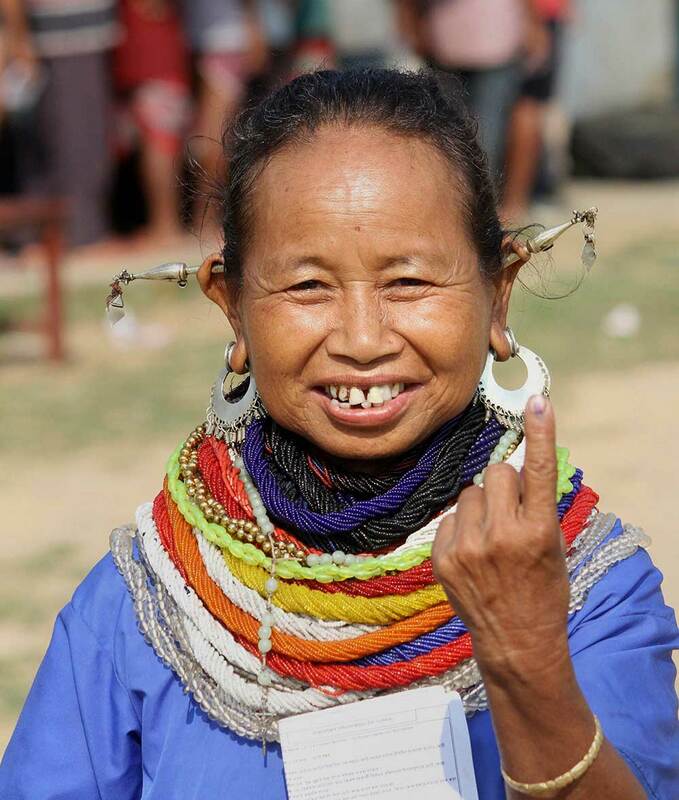 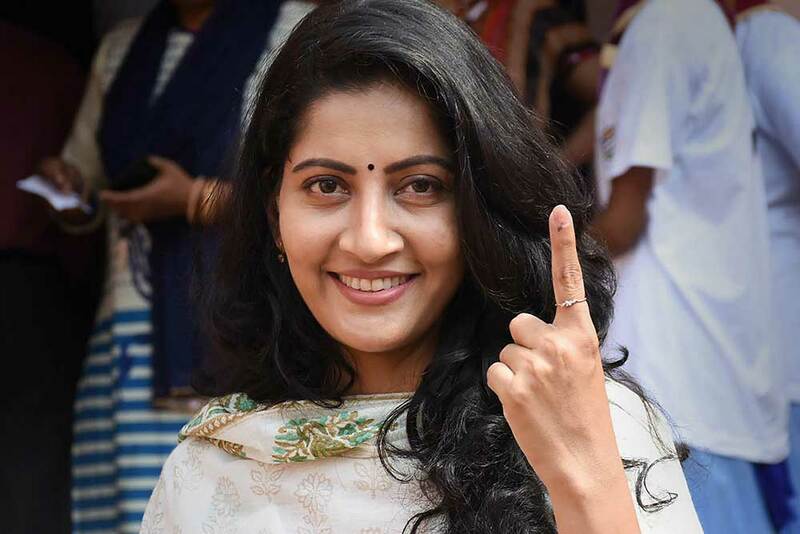 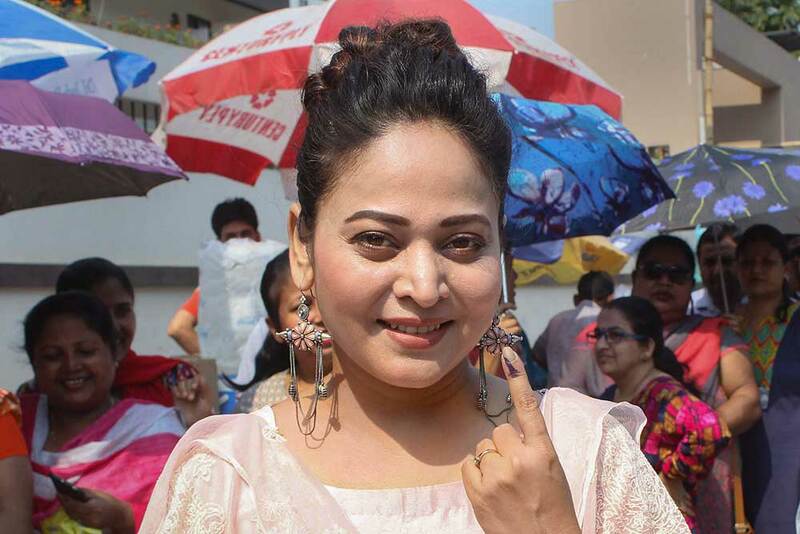 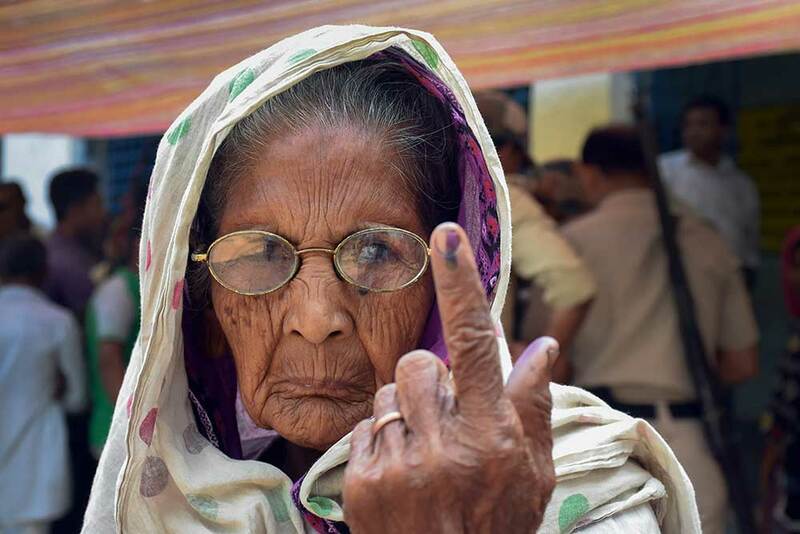 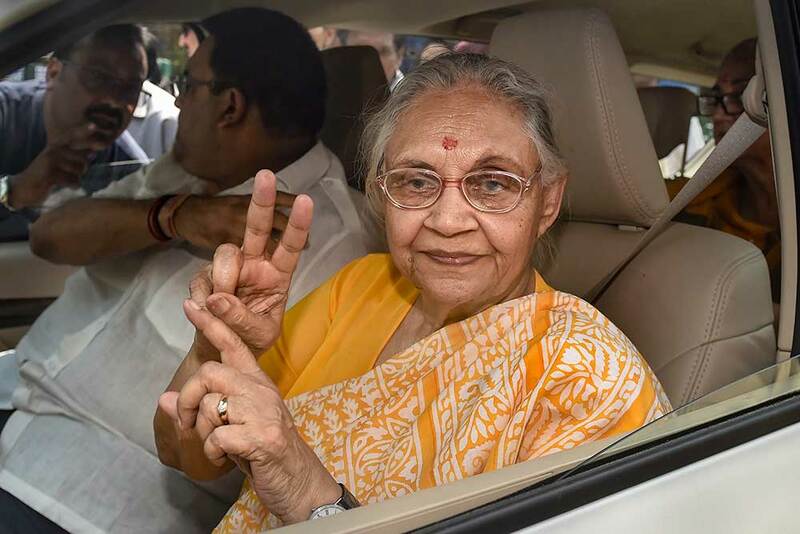 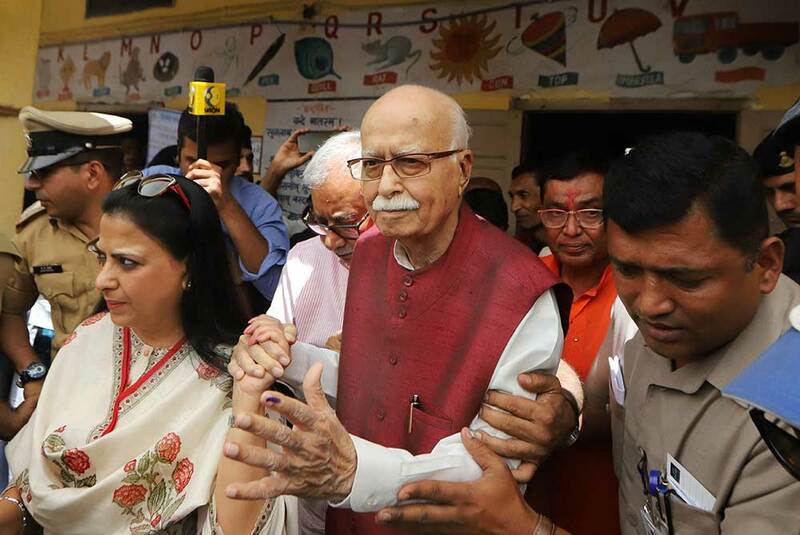 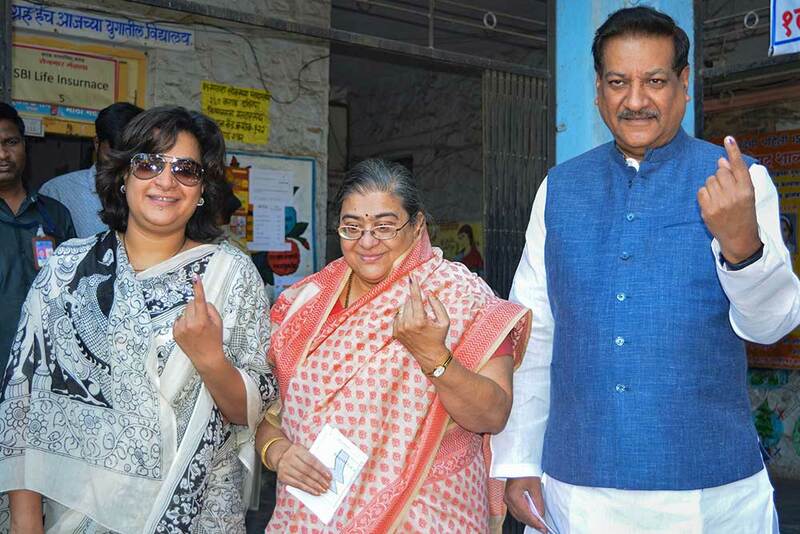 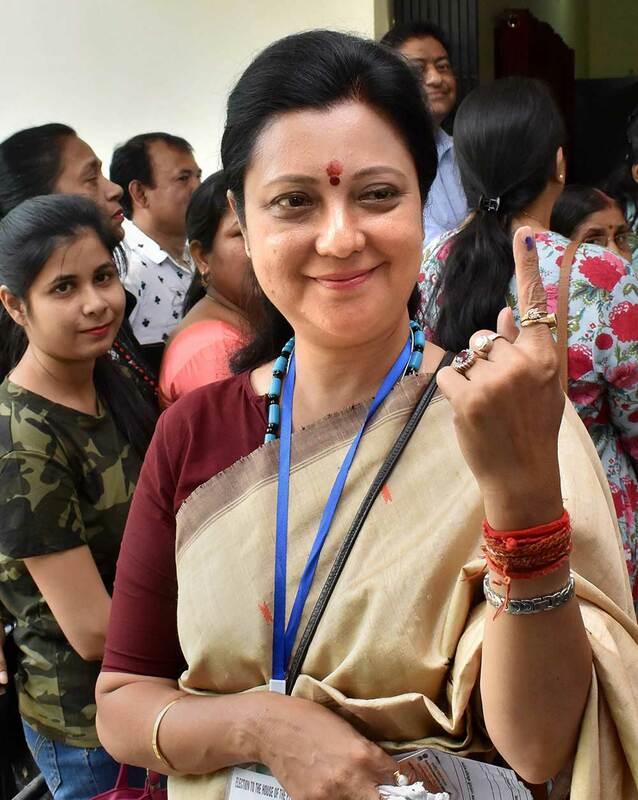 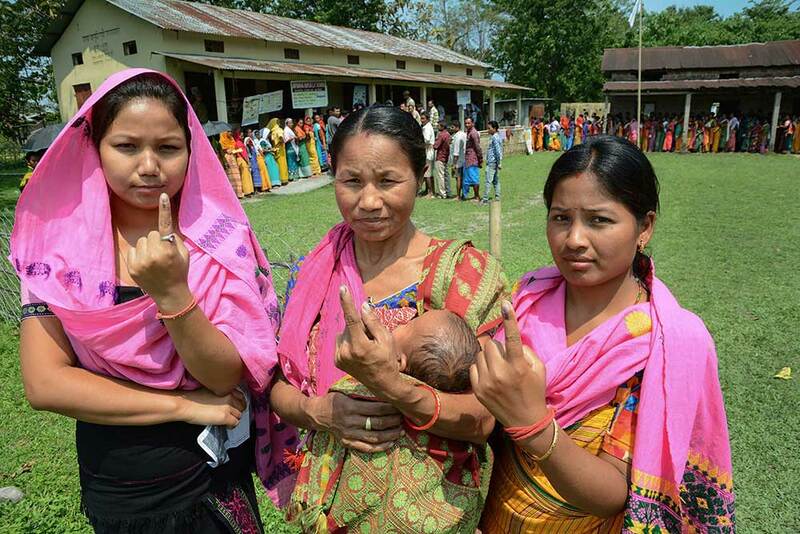 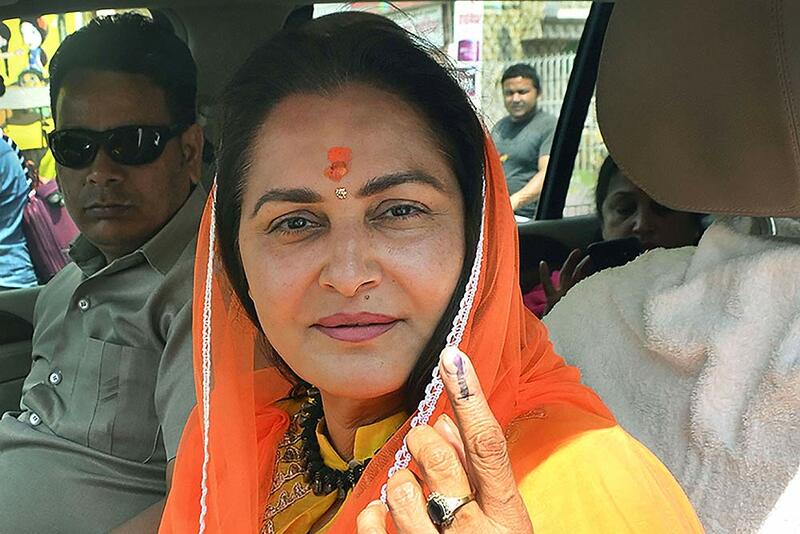 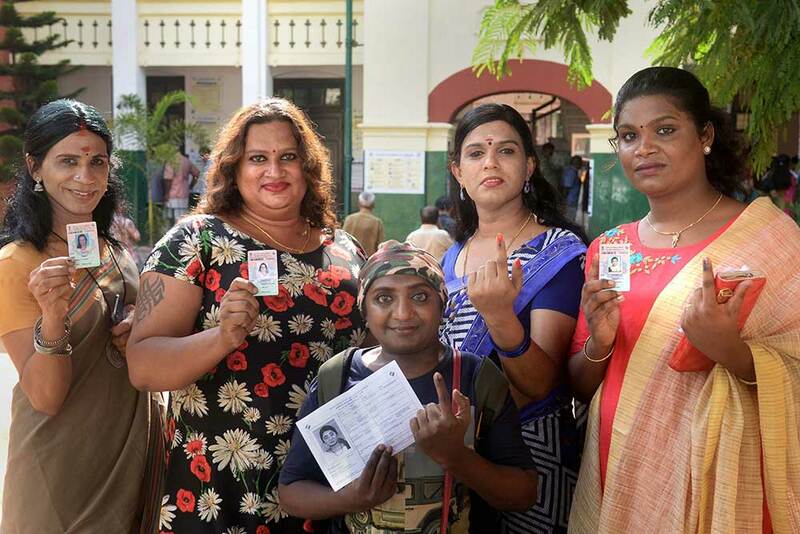 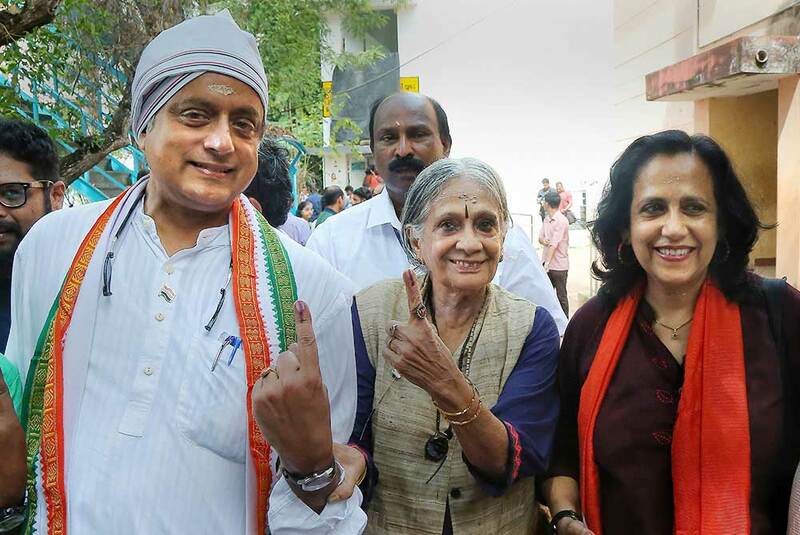 BJP parliamentary candidate from Rampur, Jaya Prada, shows her inked marked finger after casting vote, during the third phase of the 2019 Lok Sabha elections, at a polling station in Rampur. 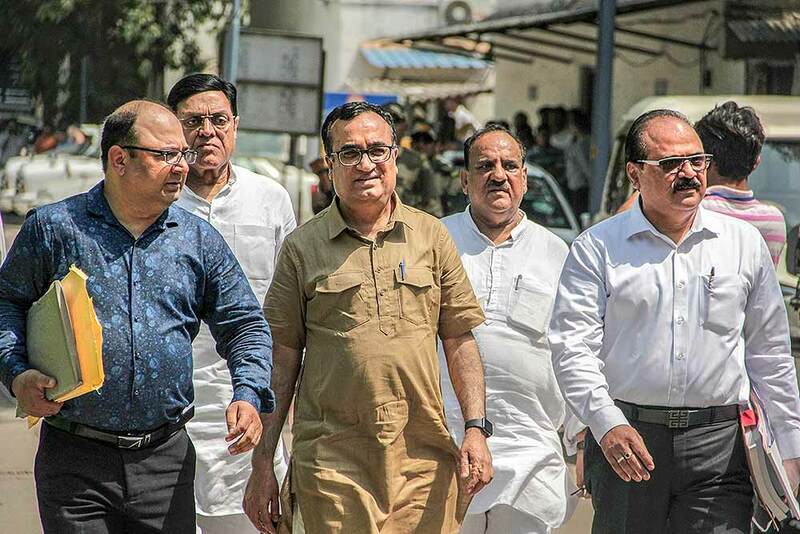 Congress candidate Ajay Maken leaves after filing his nomination for the Lok Sabha polls at District Magistrate office, in New Delhi. 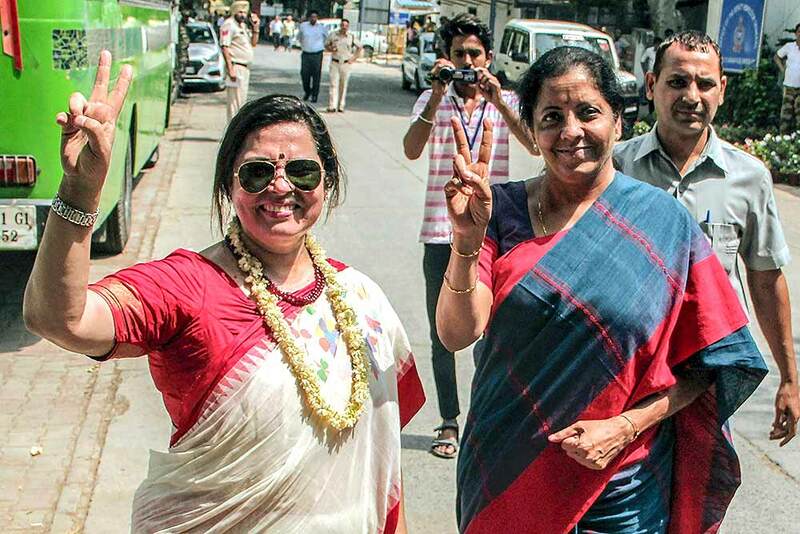 Defence Minister Nirmala Sitharaman and BJP candidate Meenakshi Lekhi flash the victory sign during the nomination filing of the latter ahead of the Lok Sabha polls, at District Magistrate office in New Delhi. 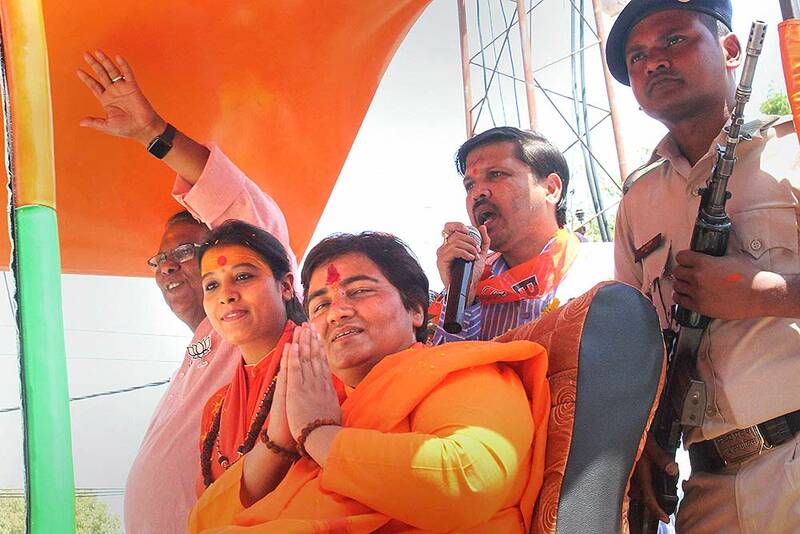 BJP candidate Sadhvi Pragya Singh Thakur files her nomination papers for Lok Sabha elections, in Bhopal. 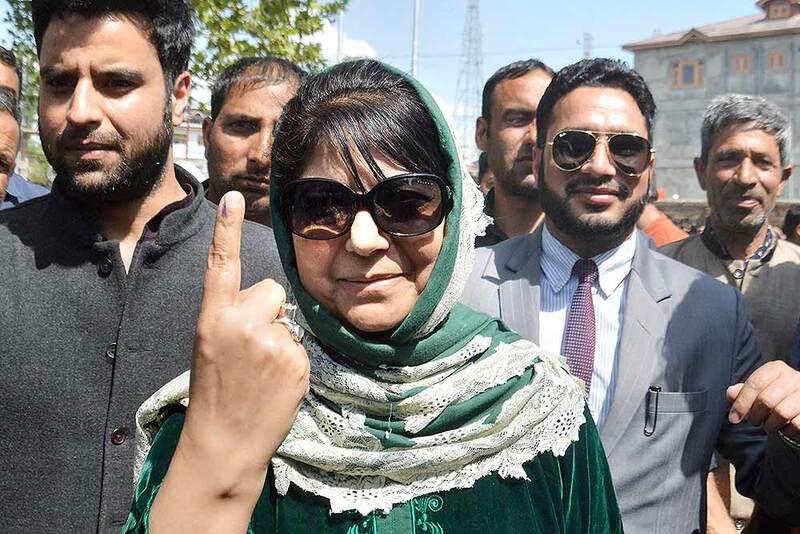 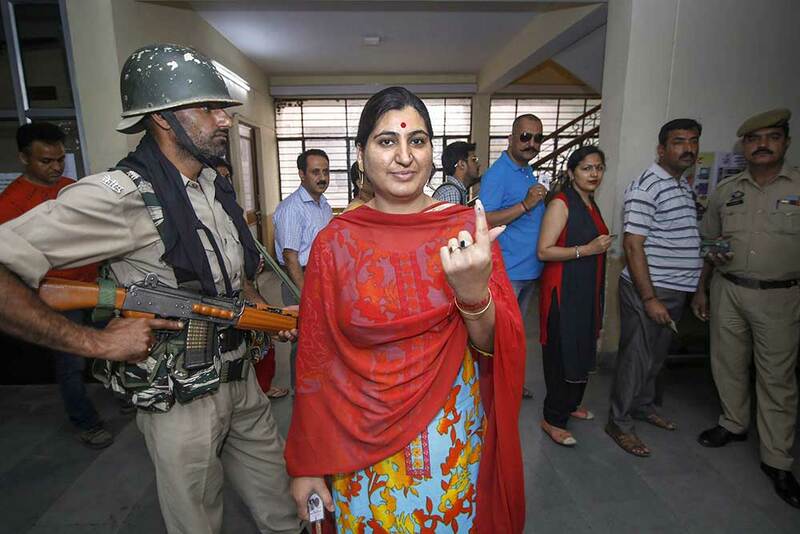 Peoples Democratic Party (PDP) President and candidate for Anantnag Lok Sabha constituency Mehbooba Mufti shows her inked finger after casting her vote at a polling station, during the third phase of Lok Sabha elections, in Anantnag district of Jammu and Kashmir. 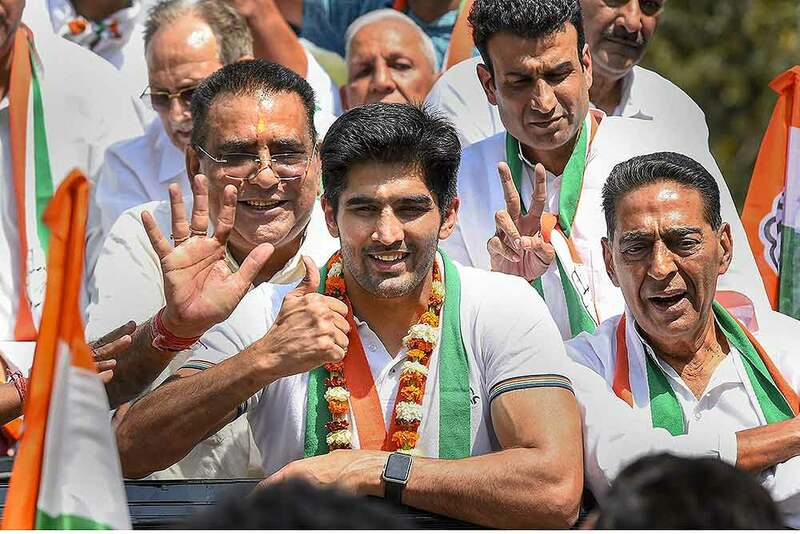 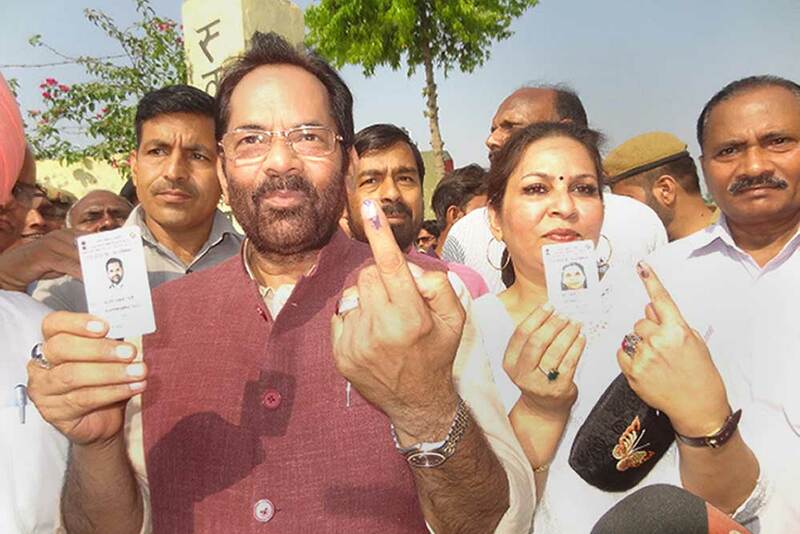 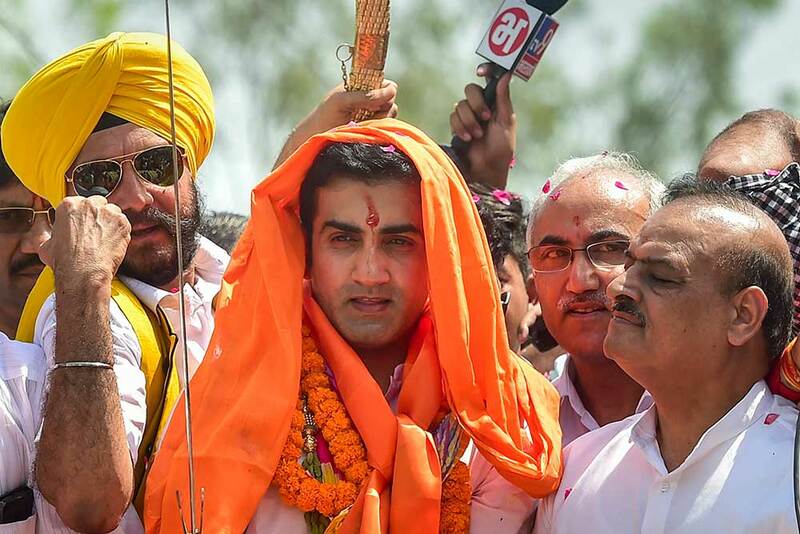 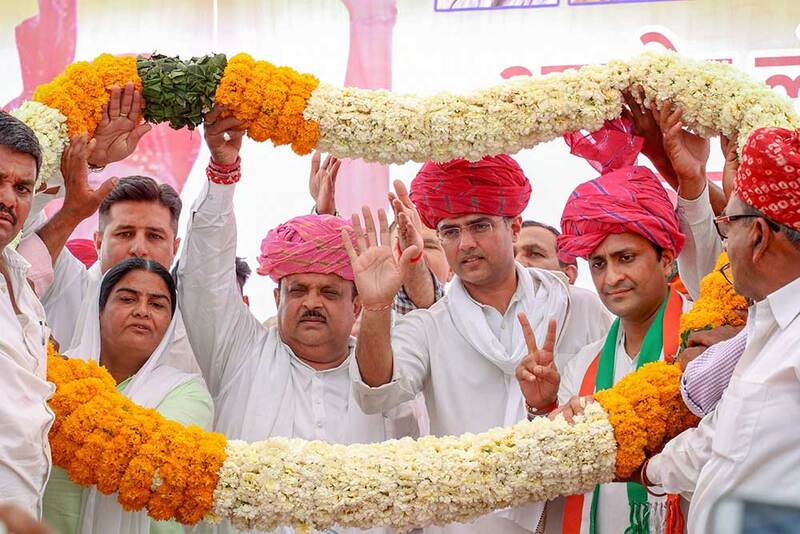 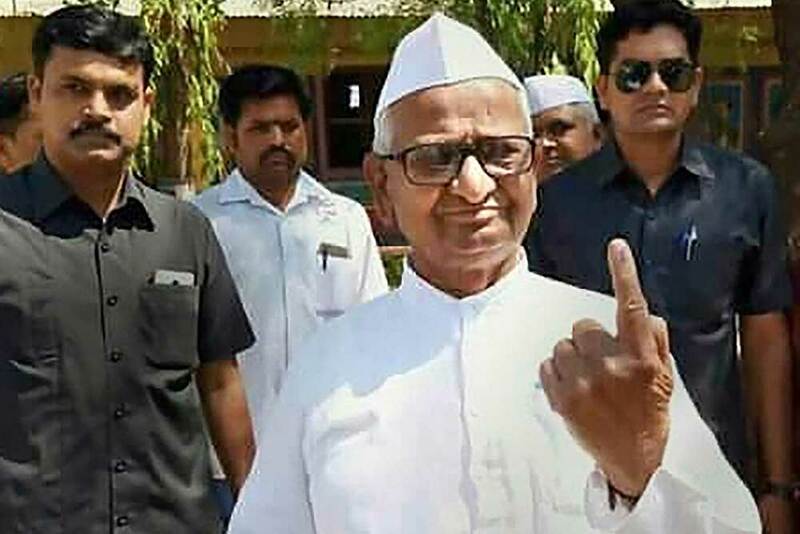 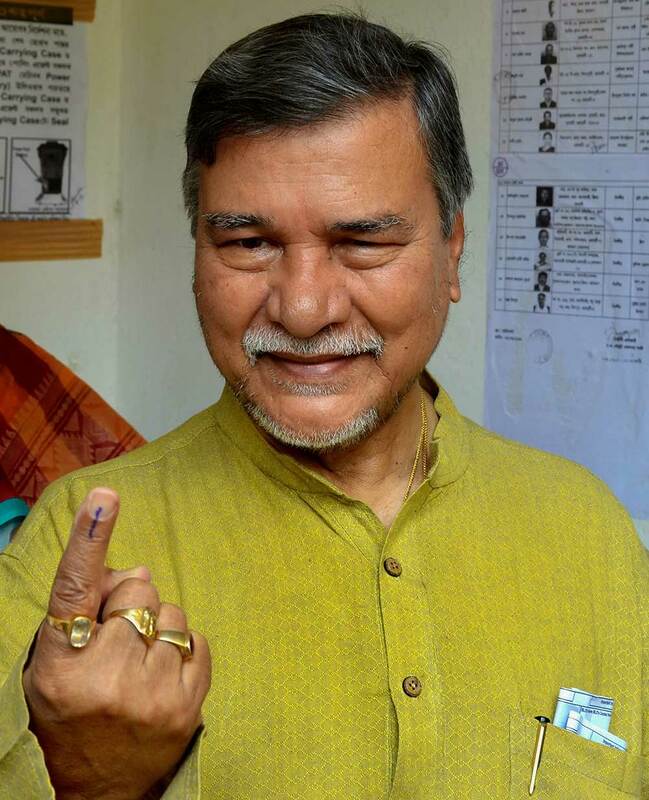 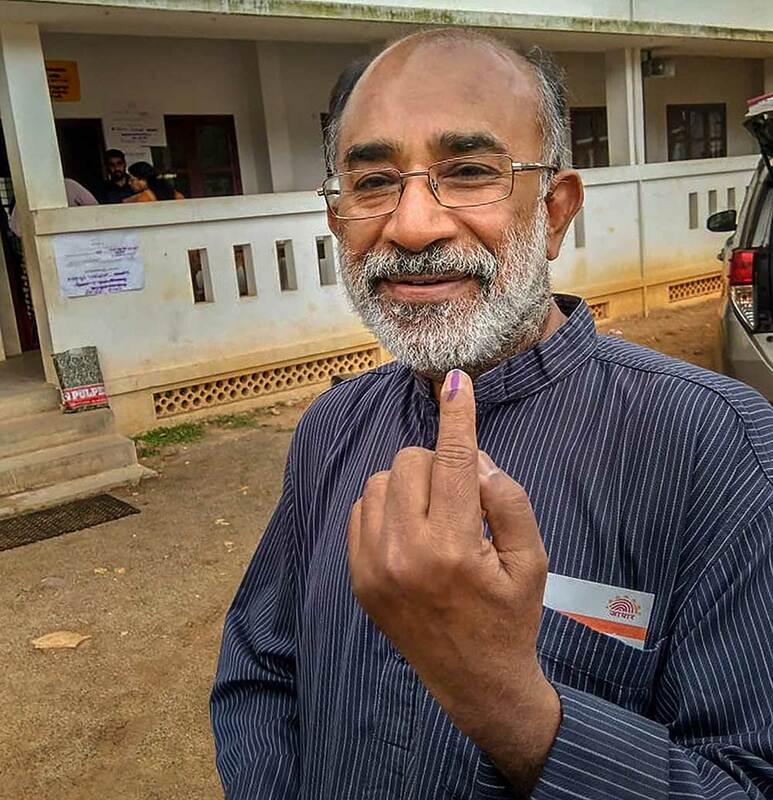 Boxer and Congress candidate from South Delhi constituency Vijender Singh flashes the victory sign during his nomination filing procession for the Lok Sabha polls, in New Delhi. 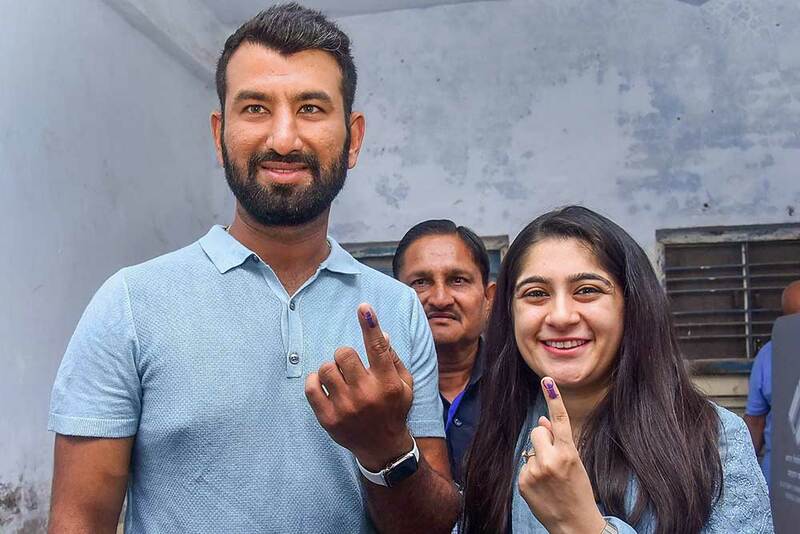 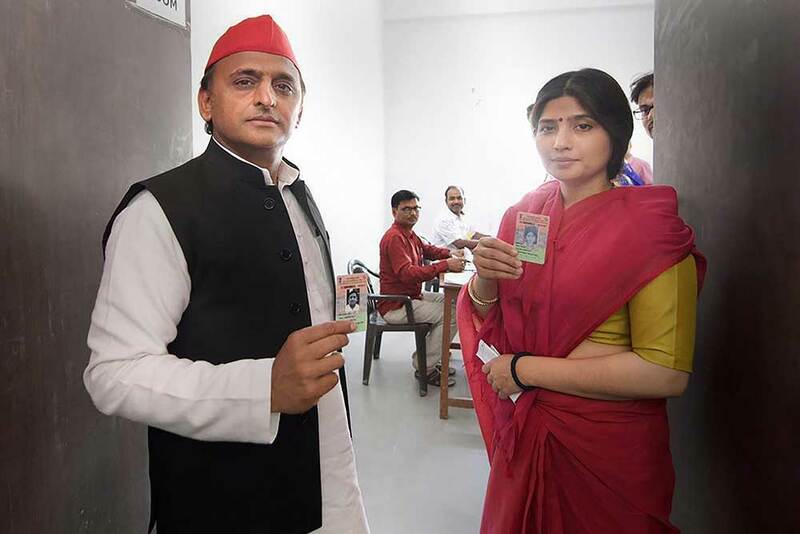 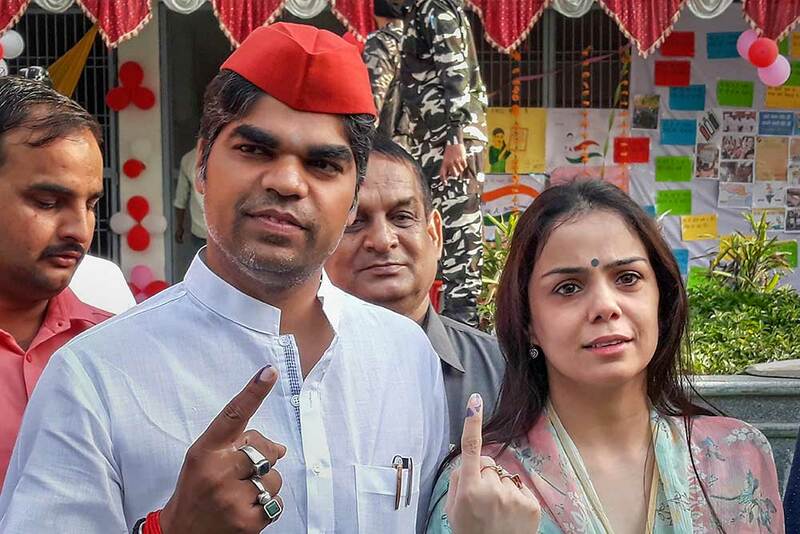 Samajwadi Party President Akhilesh Yadav and his wife Dimple Yadav before casting their votes at a polling station, during the third phase of the 2019 Lok Sabha elections, in Saifai. 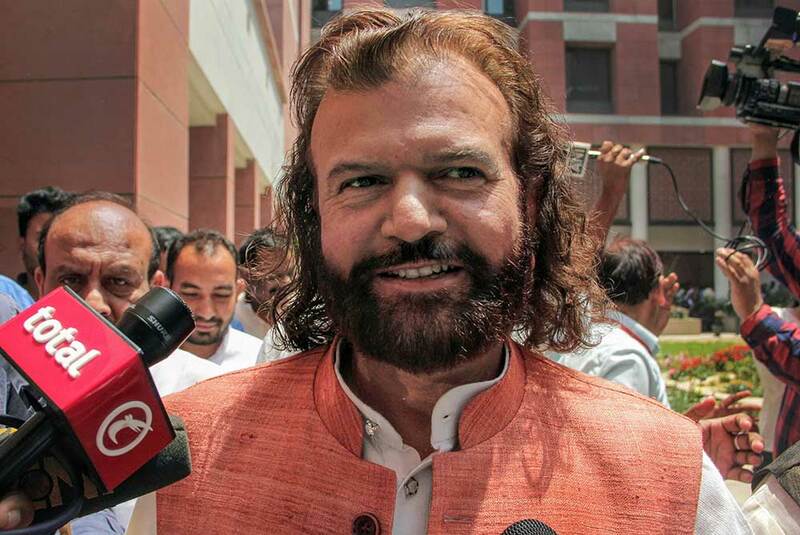 Singer Hans Raj Hans talks to the media outside the BJP headquarter in New Delhi. 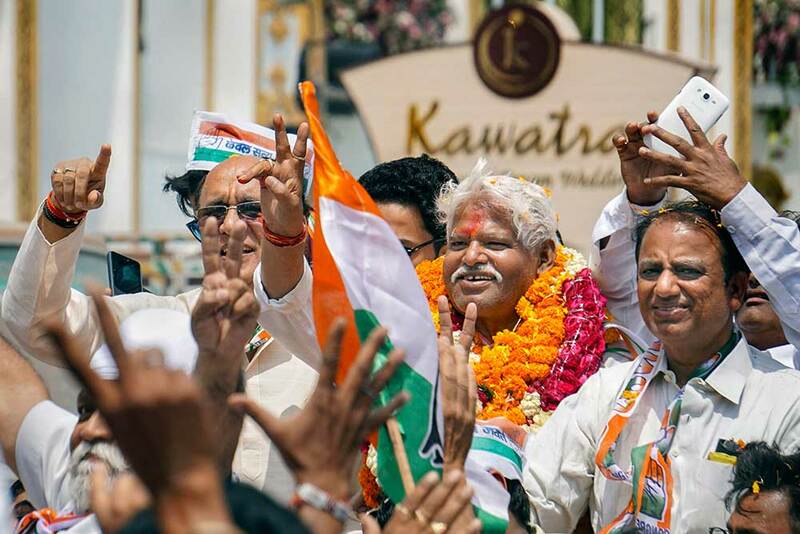 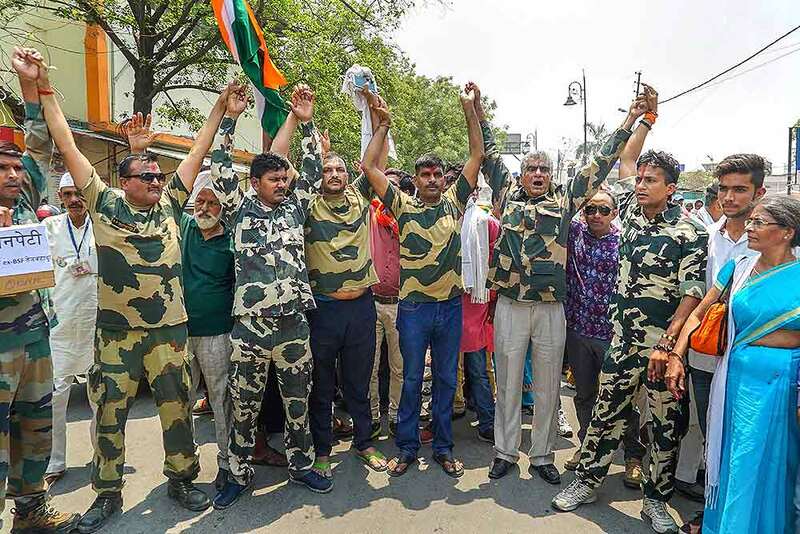 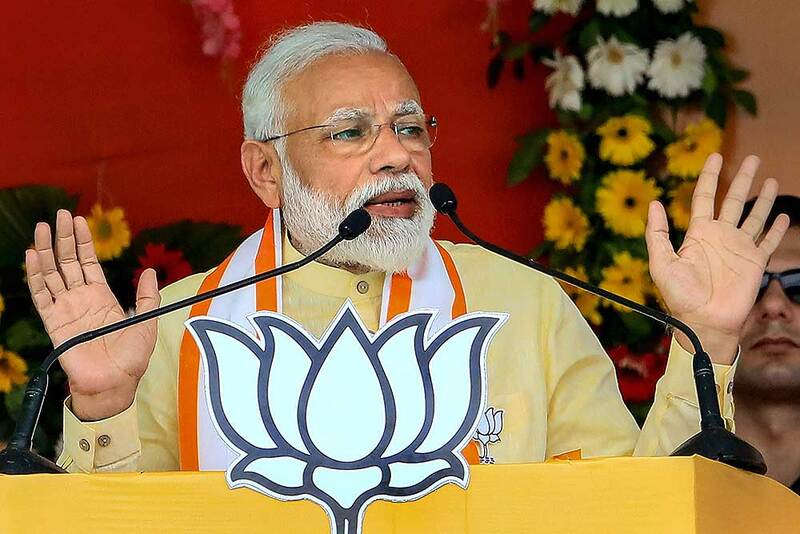 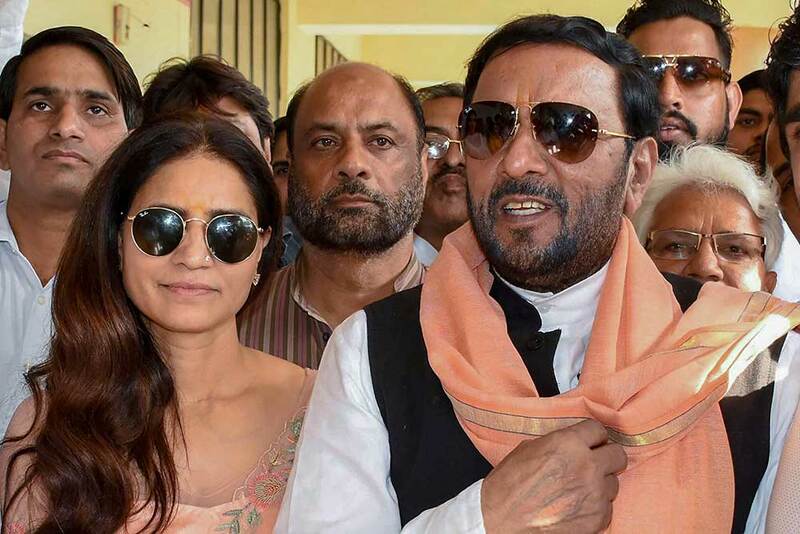 The BJP announced singer Hans Raj Hans' candidature from North-West Delhi seat despite Udit Raj, the incumbent MP from the seat, had threatened to resign from the party and contest as an independent candidate if his candidature was not announced. 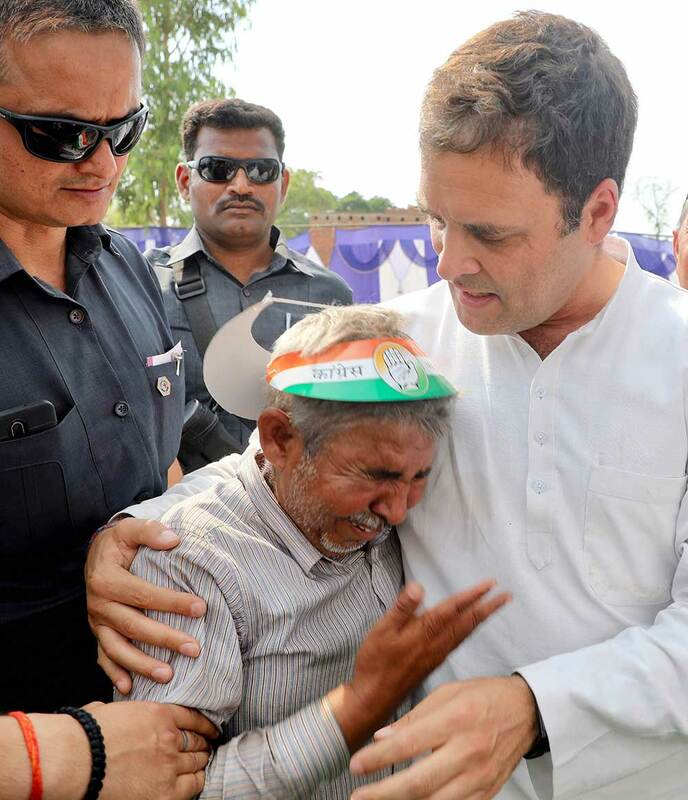 Congress President Rahul Gandhi interacts with a supporter who gets emotional, during his election campaign at Parsadepur in Raebareli. 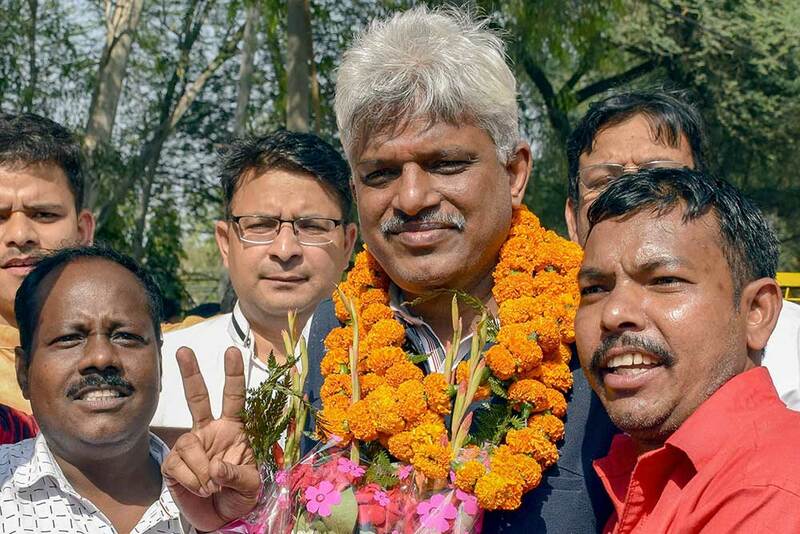 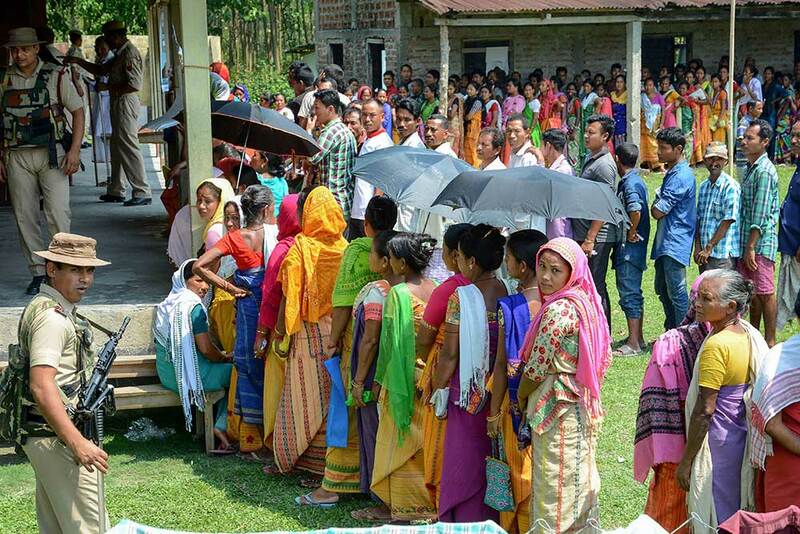 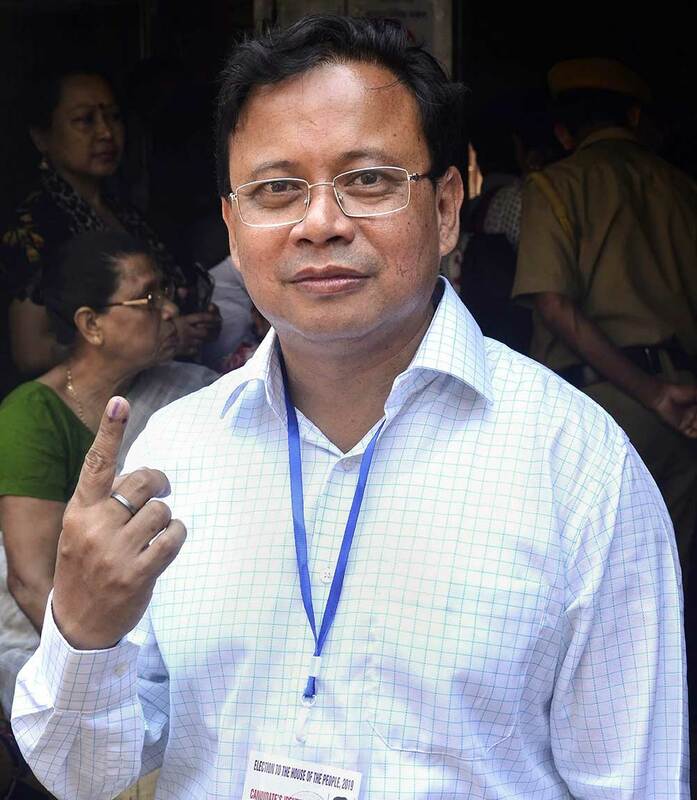 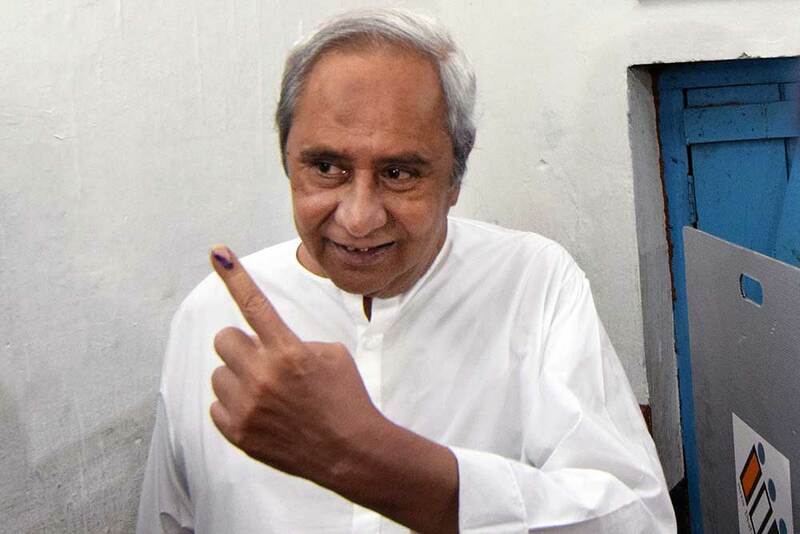 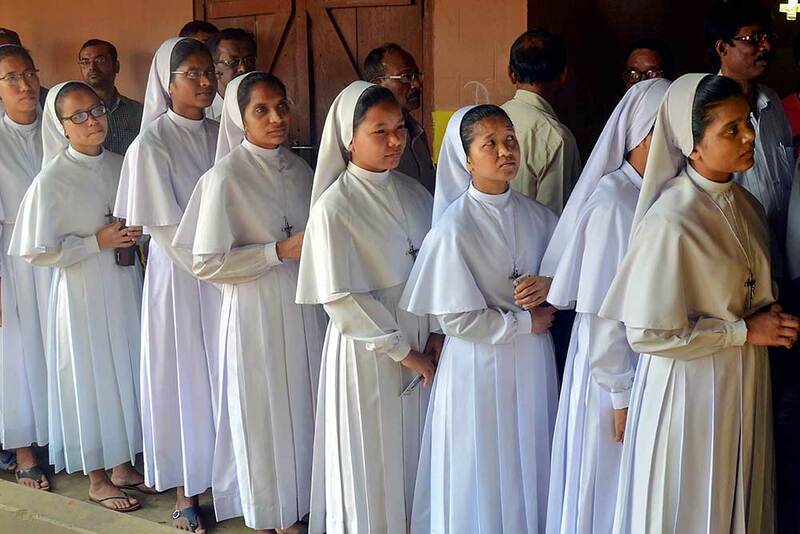 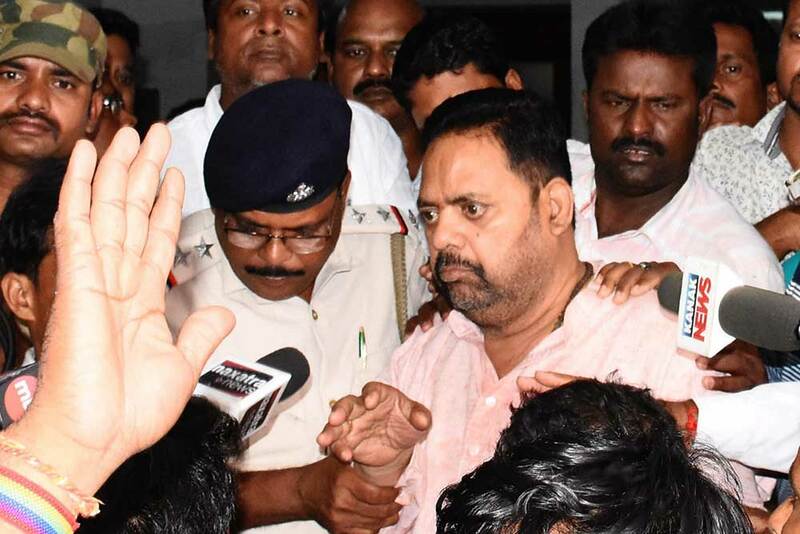 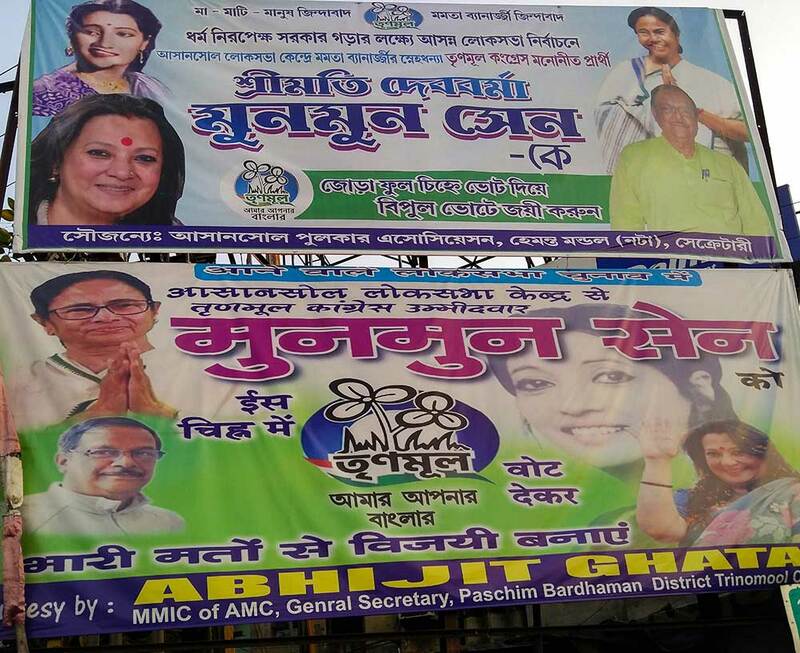 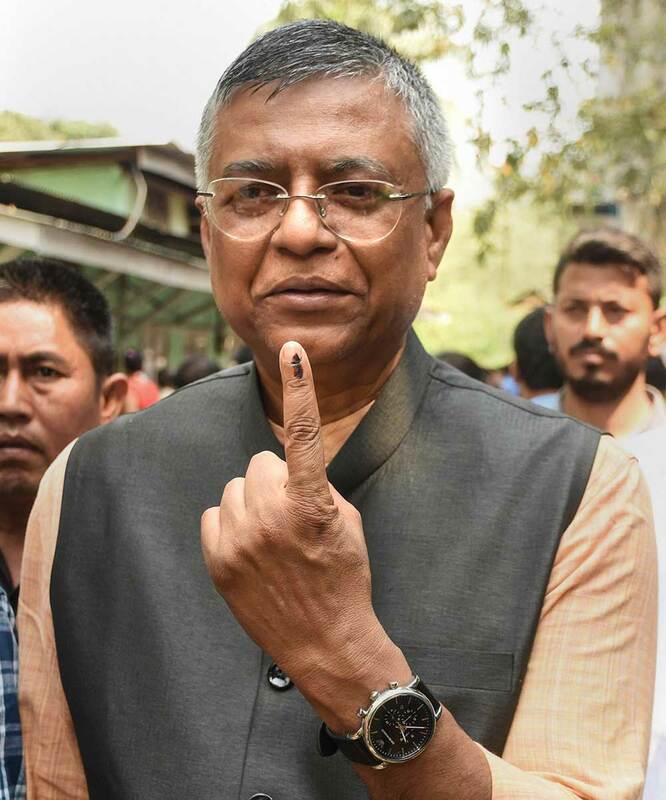 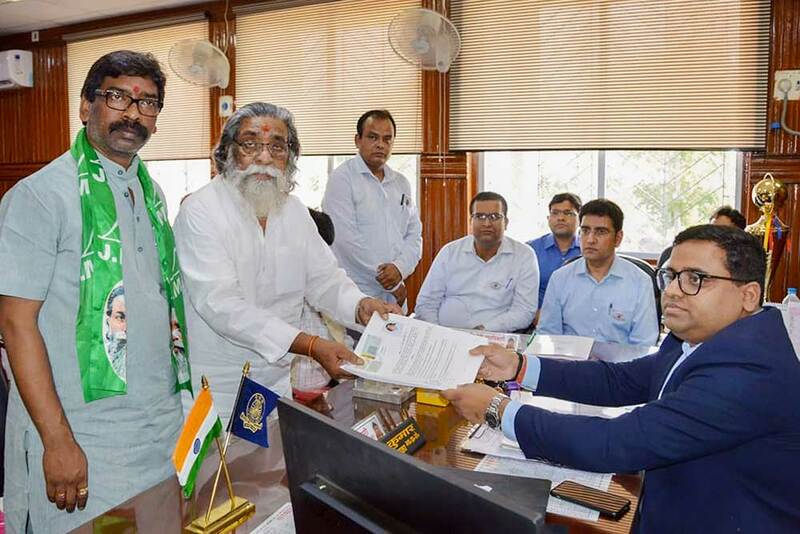 Jharkhand Mukti Morcha (JMM) Chief and candidate from Dumka parliamentary seat Shibu Soren files his nomination papers for Lok Sabha elections, in Dumka. 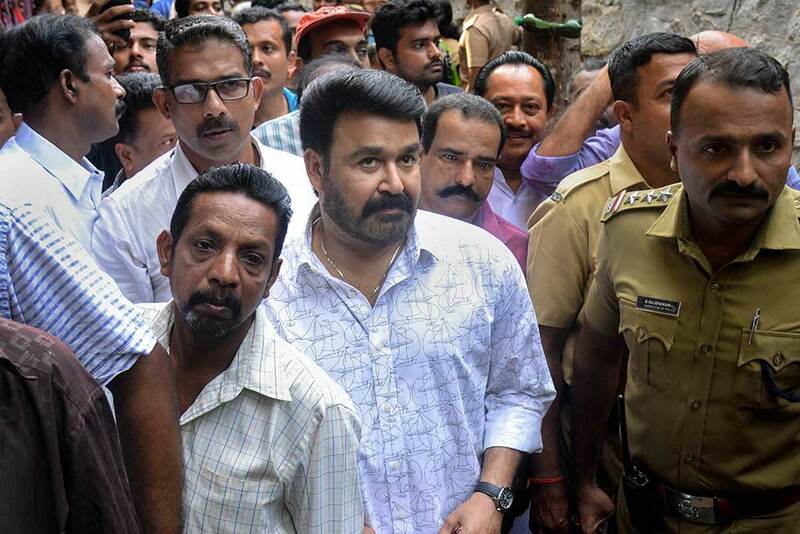 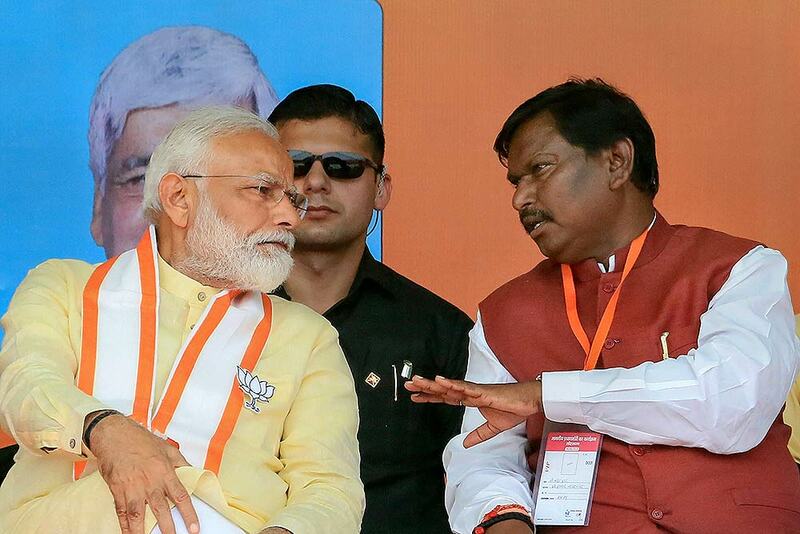 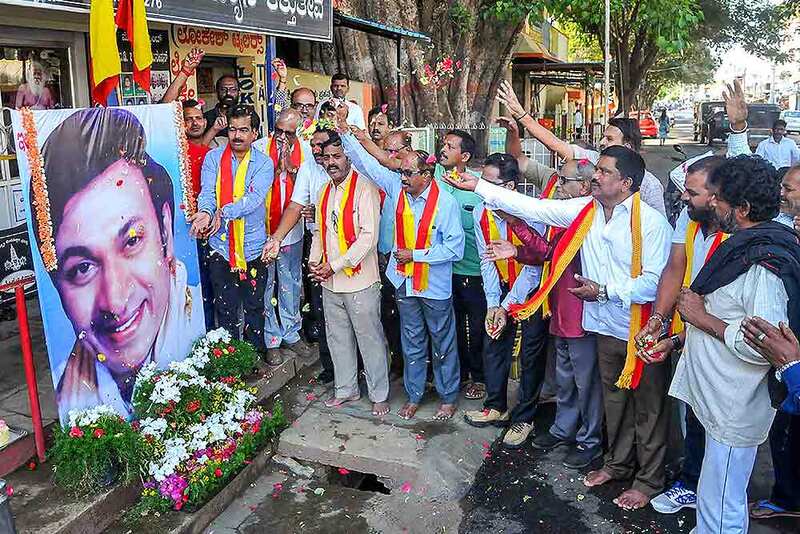 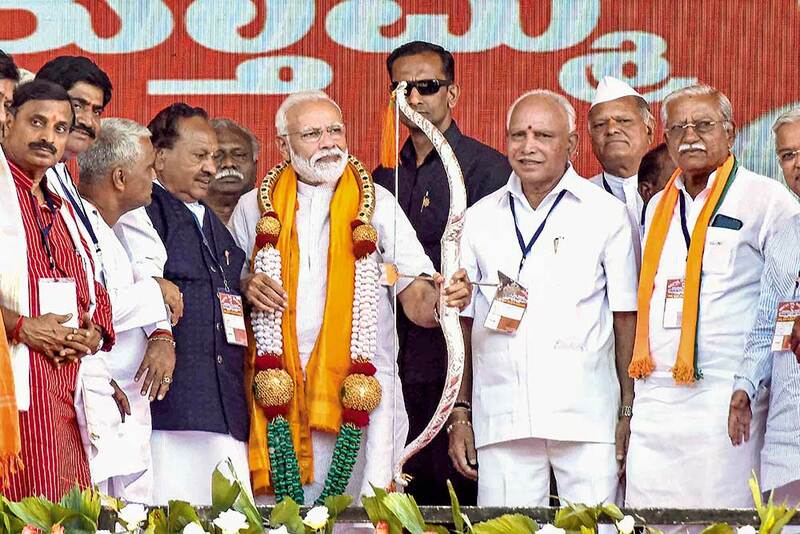 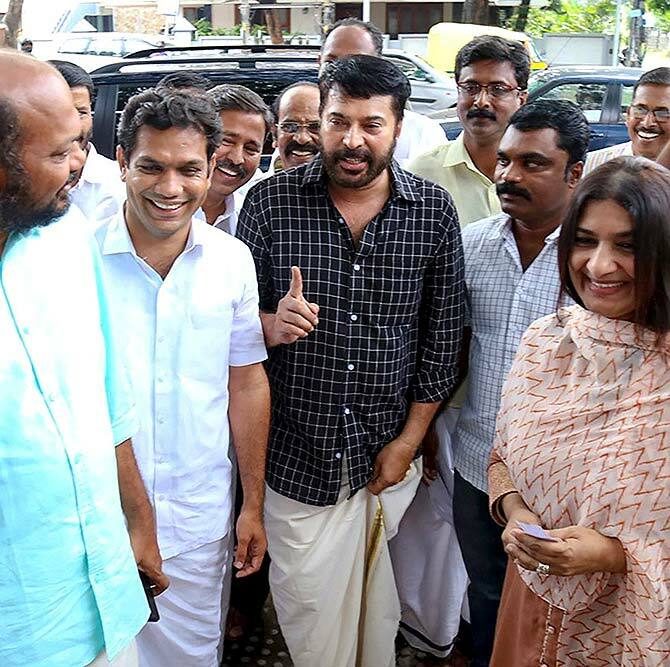 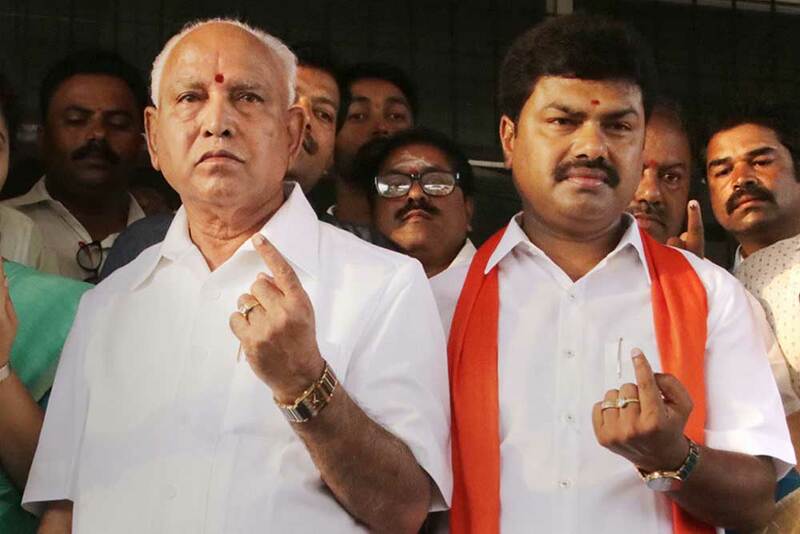 His son and party's executive president Hemant Soren is also present.